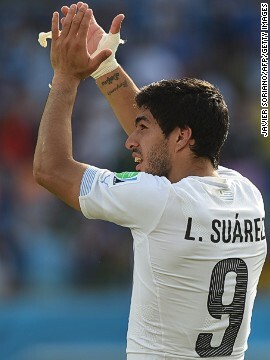 (CNN) -- Luis Suarez may have bitten off more than he can chew this time. 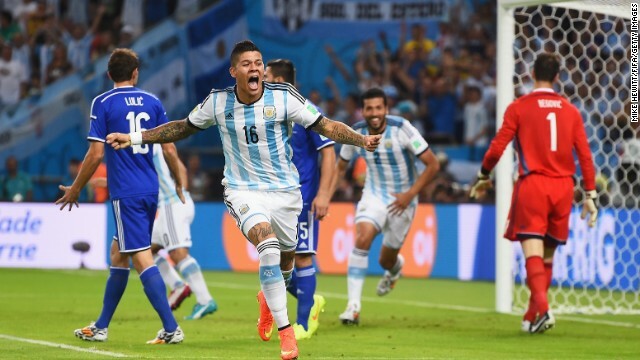 Already banned twice in his career for biting an opponent, the Uruguay striker was seemingly at it again in his country's key World Cup victory over Italy. 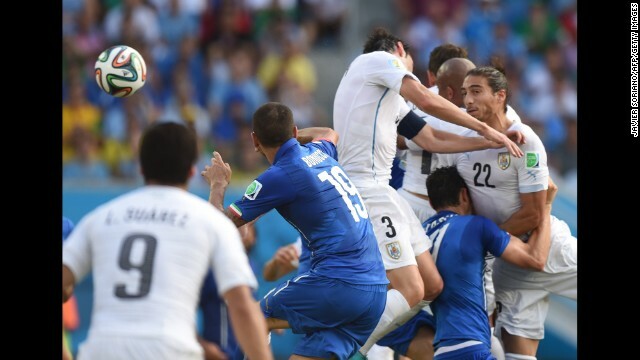 Just before Uruguay's winning goal, the striker was embroiled in an off the ball incident with Italy defender Giorgio Chiellini with both men falling to the floor. 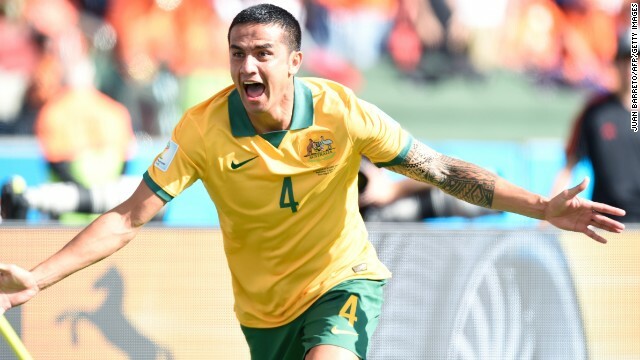 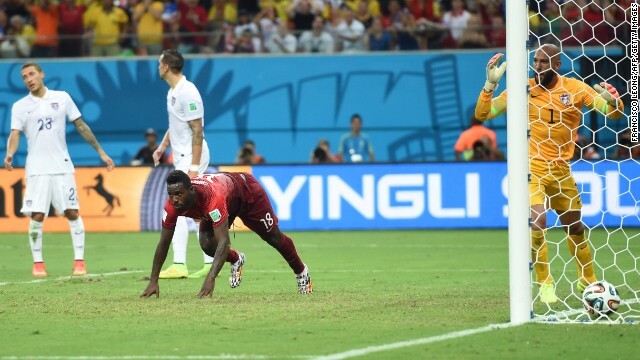 Fangs coming out at the World Cup? 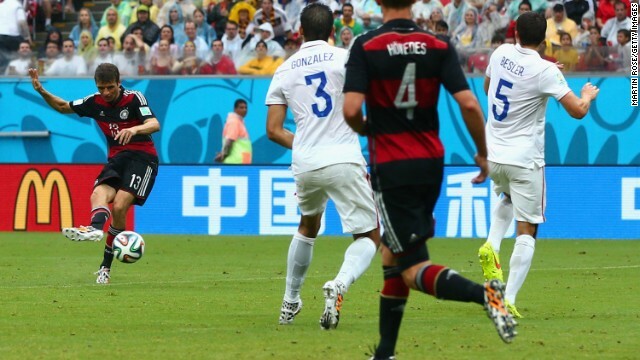 And he could be facing a lengthy ban -- despite his attempts to play down the incident. 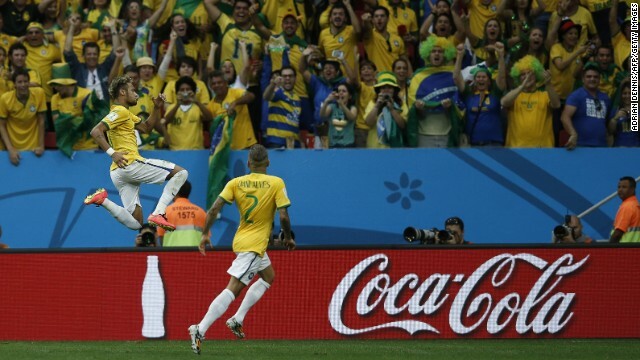 "The only thing I know is that those are occurrences that happen on the pitch," Suarez told reporters. 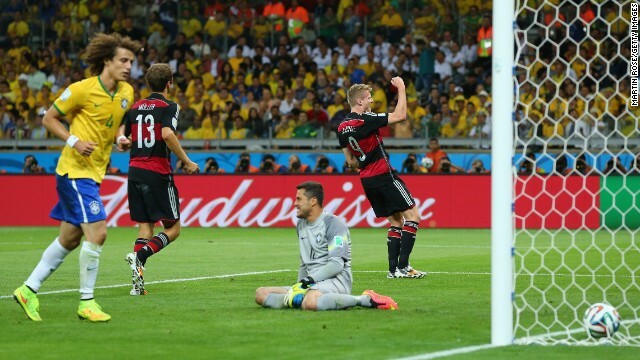 "I just collided with his shoulder. 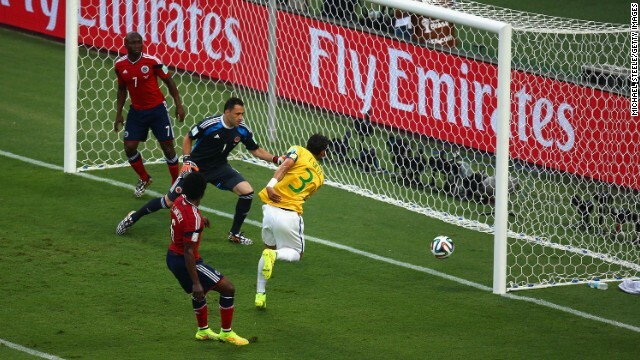 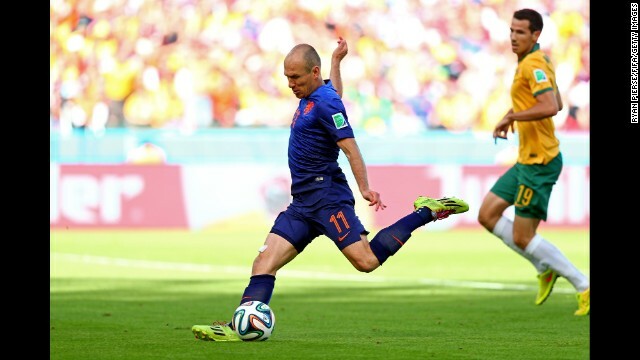 They are just casual incidences that occur during a soccer game. " 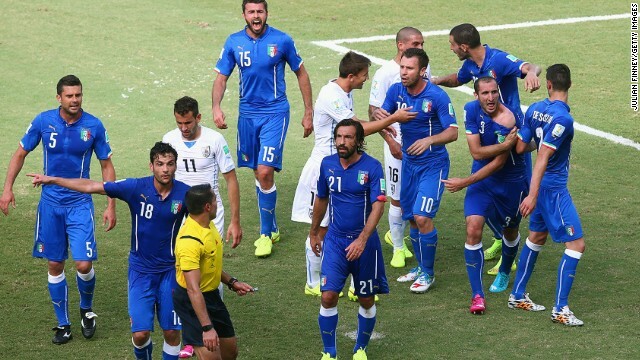 Television pictures showed Suarez dipping his head towards Chiellini, and when the Italian defender eventually got up, he pulled down his shirt and appeared to furiously indicate that he had been bitten on the shoulder. 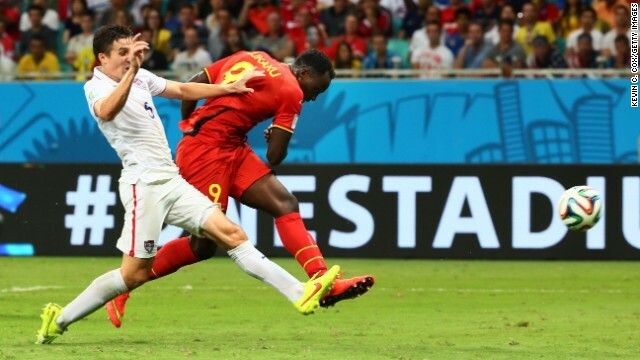 "Suarez is a sneak and he gets away with it because FIFA want their stars to play in the World Cup," Chiellini told Sky Sports Italia. 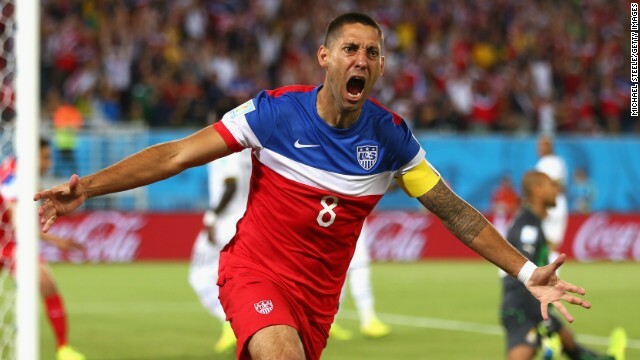 "I'd love to see if they have the courage to use video evidence against him. 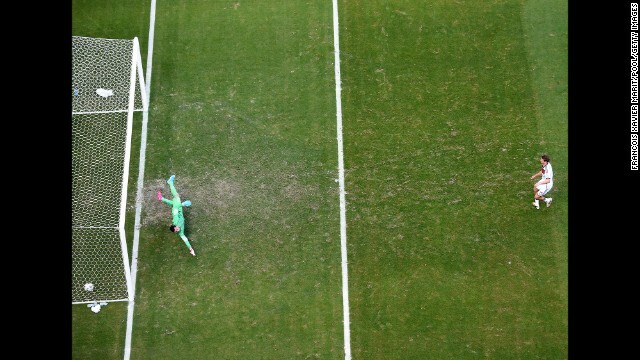 The referee saw the bite mark too, but he did nothing about it.," added the Juventus defender. 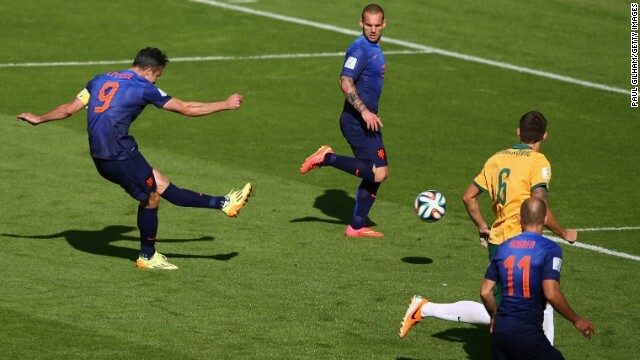 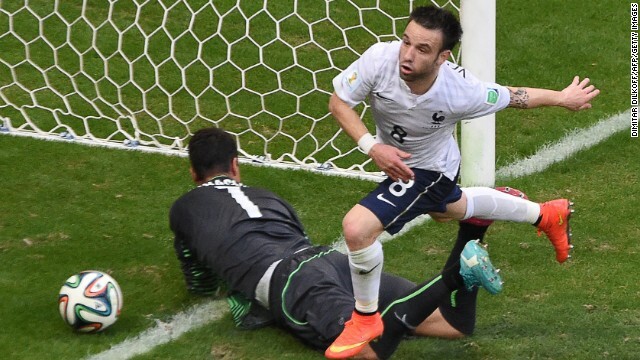 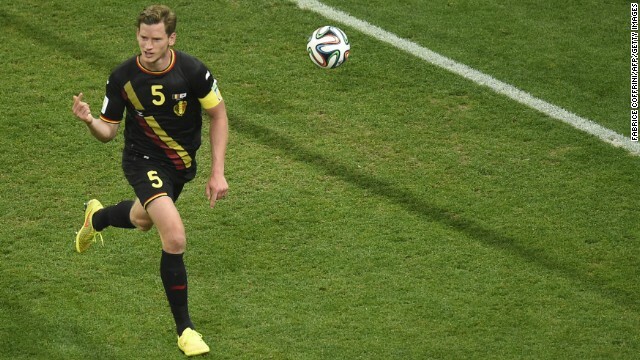 FIFA has opened proceedings against the forward, for breach of FIFA disciplinary code. 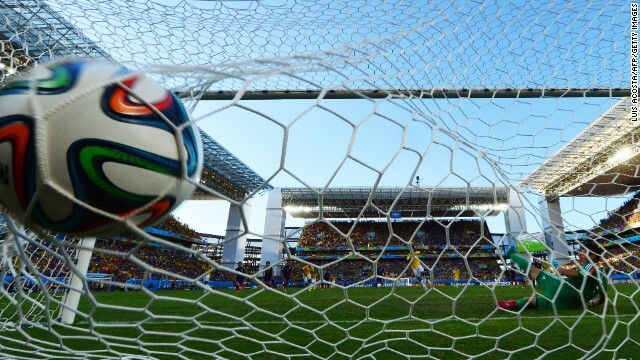 FIFA added that Suarez and/or his national association are invited to provide their position and any documentary evidence they deem relevant, with a 5pm (Brasilia time) deadline. 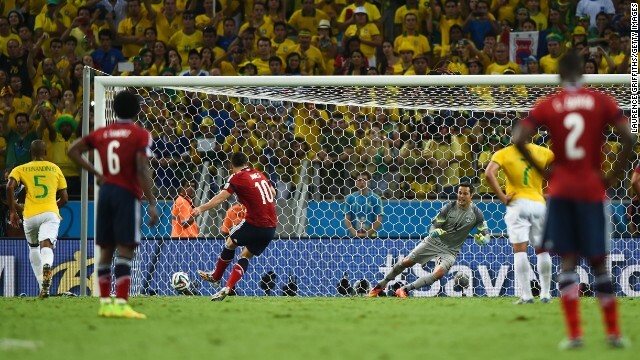 The 27-year-old Suarez will now face a nervous wait to find out if football's world governing body FIFA will take action retrospectively -- given it was missed by the match officials - and punish him. 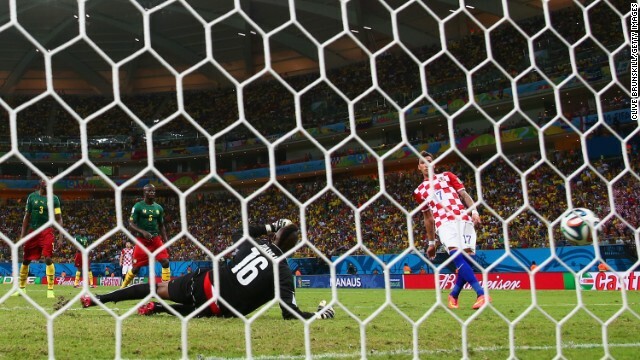 But FIFA vice-president Jim Boyce, who also presides as head of the organizations referees committee, says he has huge concerns over Suarez's actions. 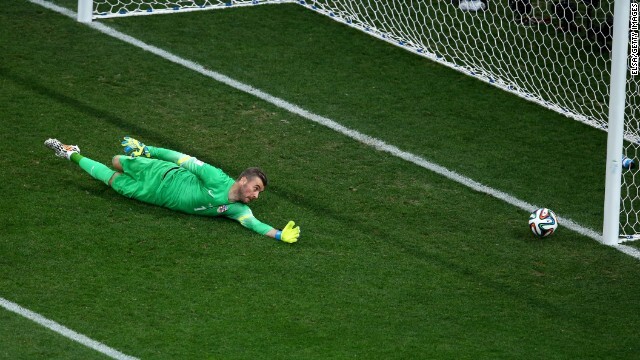 "I have watched the incident several times on television," he told reporters. 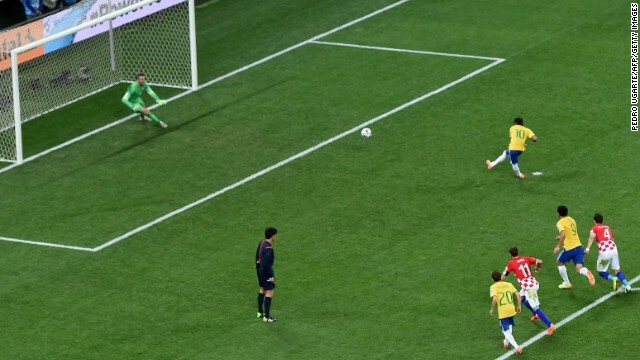 "There is no doubt Luis Suarez is a fantastic footballer but, once again, his actions have left him open to severe criticism. 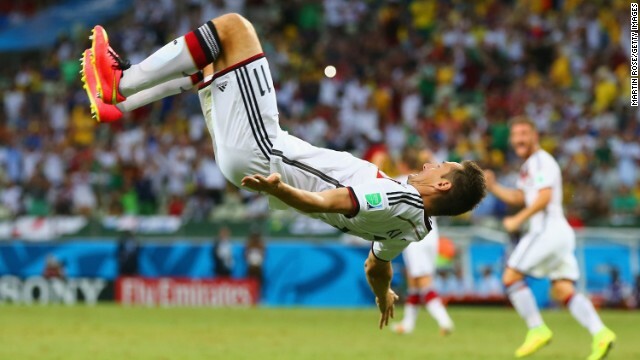 According to FIFA's disciplinary code, the forward could face a maximum ban of 24 matches or two years. 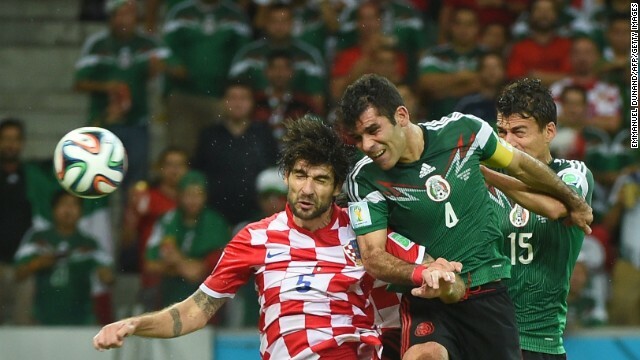 Former Italian international Mauro Tassotti was given an eight-match ban in 1994, the longest suspension in World Cup history, after breaking the nose of Spain's Luis Enrique. 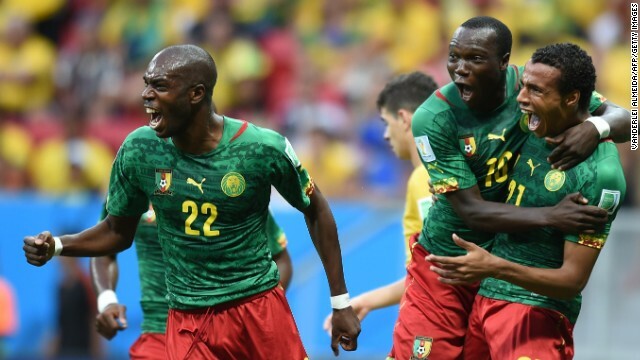 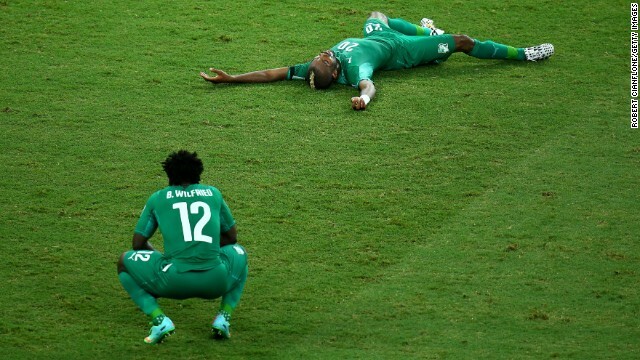 A dejected Wilfried Bony, left, and Die Serey of the Ivory Coast react after being defeated by Greece 2-1 during a World Cup match on Tuesday, June 24, in Fortaleza, Brazil. 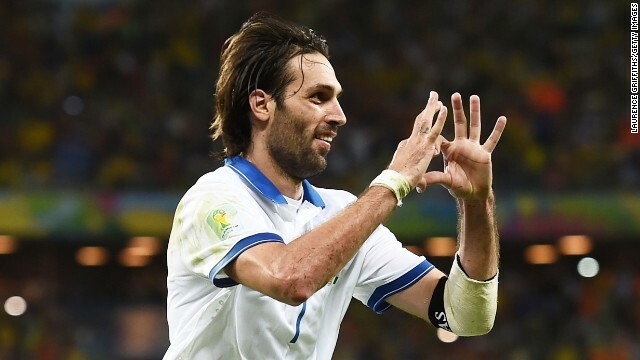 Greece's Georgios Samaras, right, celebrates scoring a penalty. 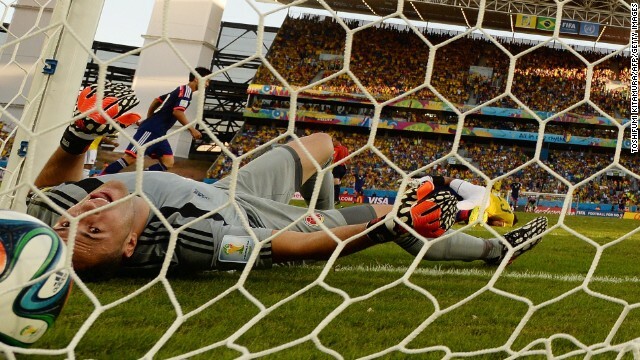 Goalkeeper Faryd Mondragon of Colombia acknowledges fans after his team defeated Japan 4-1 during a match in Cuiaba, Brazil. 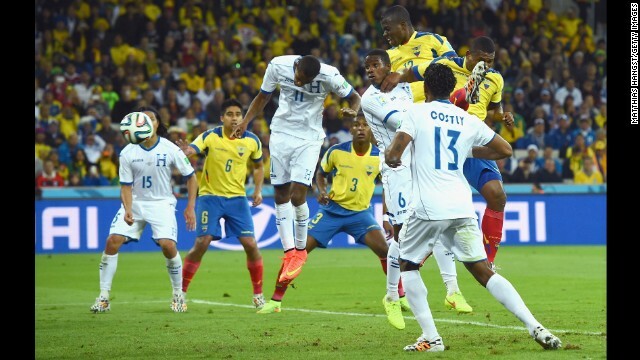 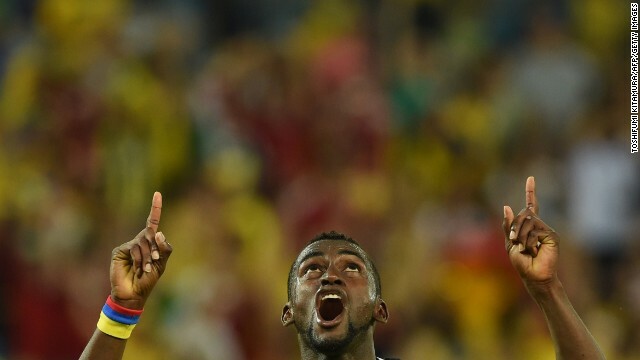 Colombia's Jackson Martinez celebrates after scoring his second goal against Japan. 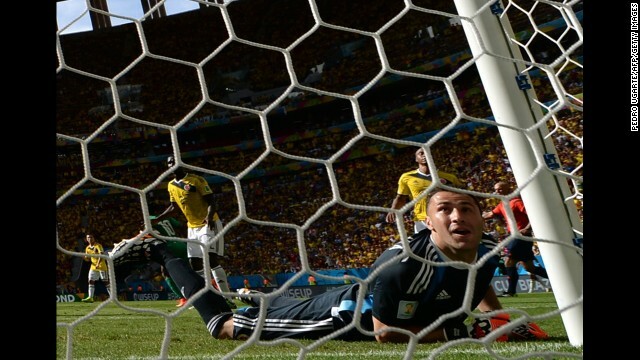 Colombia's James Rodriguez celebrates after scoring his team's fourth goal past goalkeeper Eiji Kawashima of Japan. 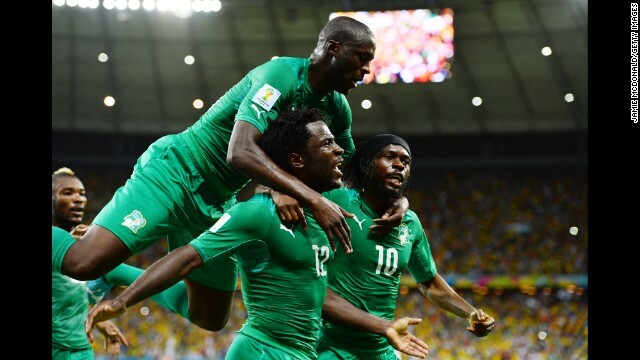 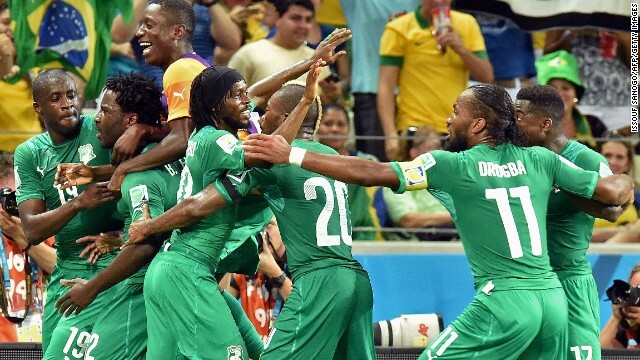 Wilfried Bony of the Ivory Coast celebrates scoring his team's first goal with Yaya Toure, left, and Gervinho. 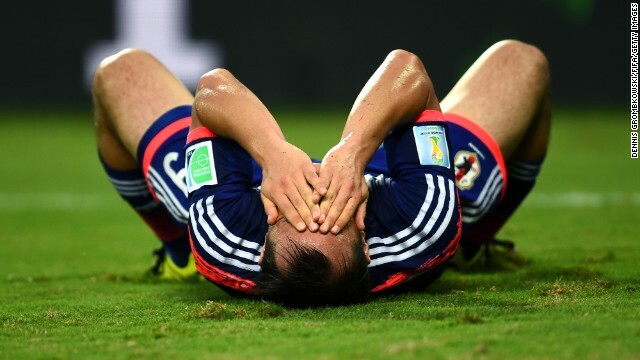 Shinji Okazaki of Japan reacts during the game against Colombia. 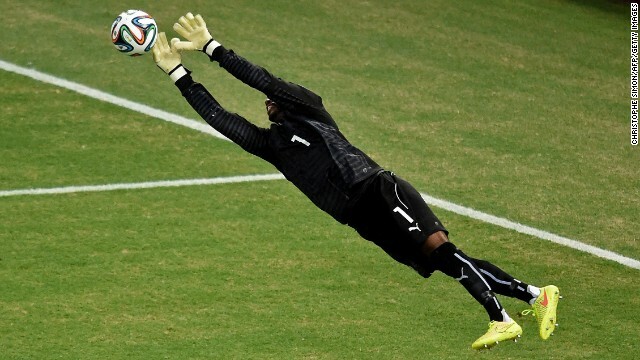 Ivory Coast's goalkeeper Boubacar Barry makes a save against Greece. 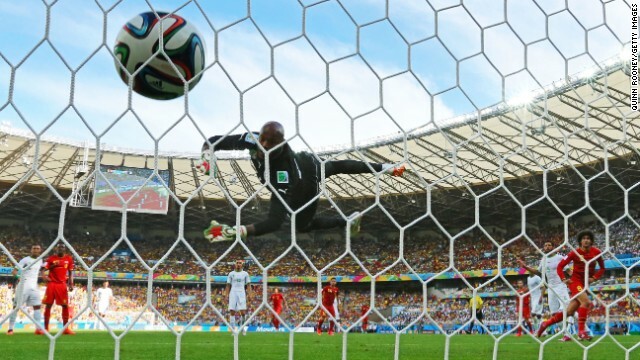 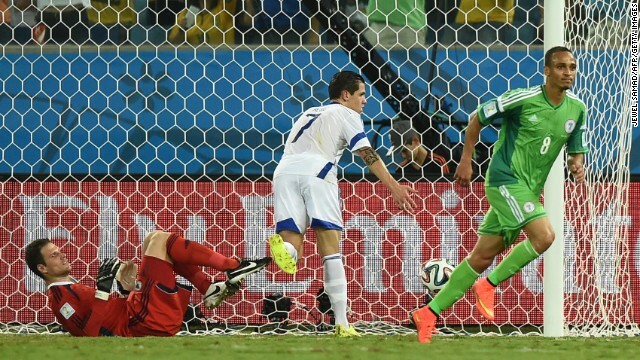 Boubacar Barry of the Ivory Coast makes a save while Dimitris Salpingidis of Greece tries to take a shot. 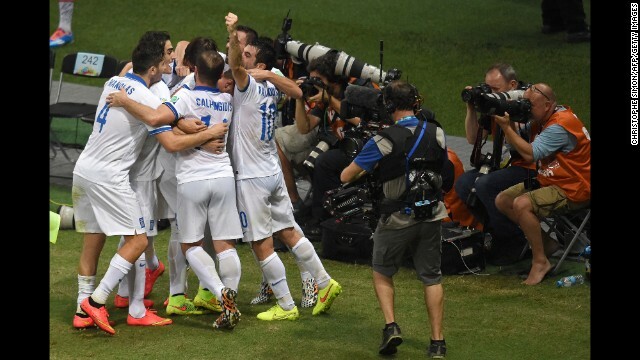 Greece's players celebrates scoring against the Ivory Coast. 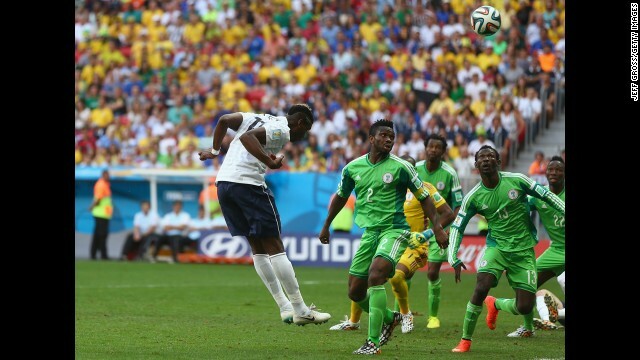 Ivory Coast's Didier Drogba heads the ball. 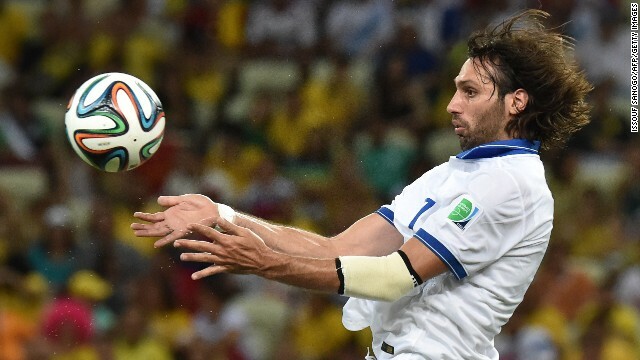 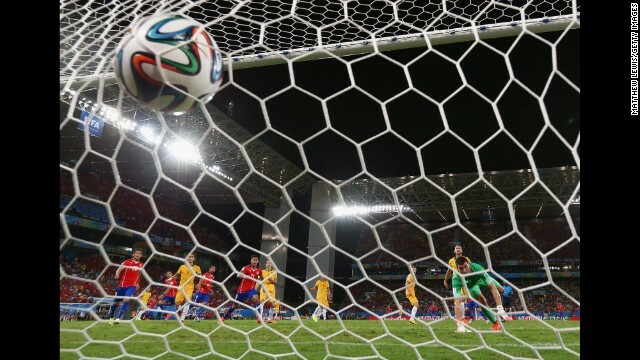 Greece's Georgios Samaras controls the ball. 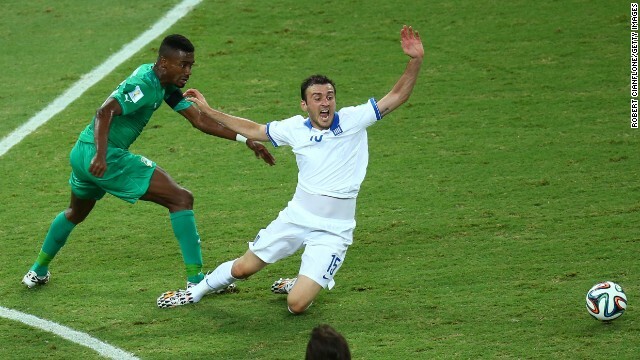 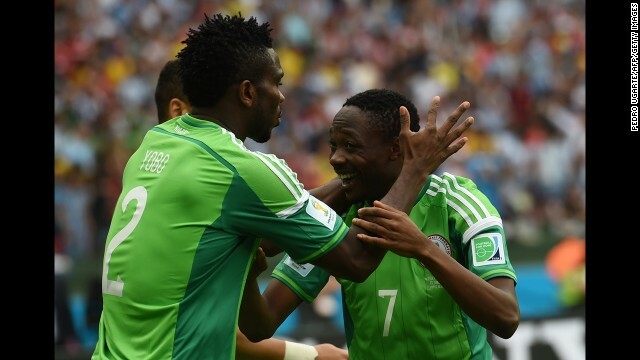 Salomon Kalou of the Ivory Coast challenges Vasilis Torosidis of Greece. 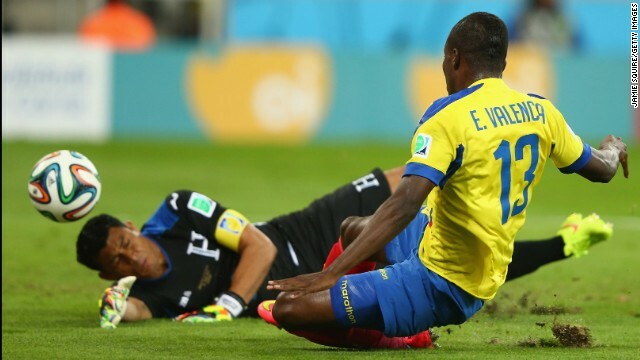 Japan's Yoshito Okubo, bottom, and Colombia's Carlos Valdes vie for the ball. 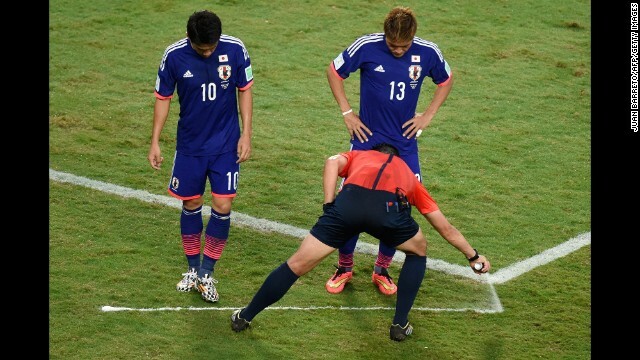 Referee Pedro Proenca sprays a free kick line during the match between Japan and Colombia. 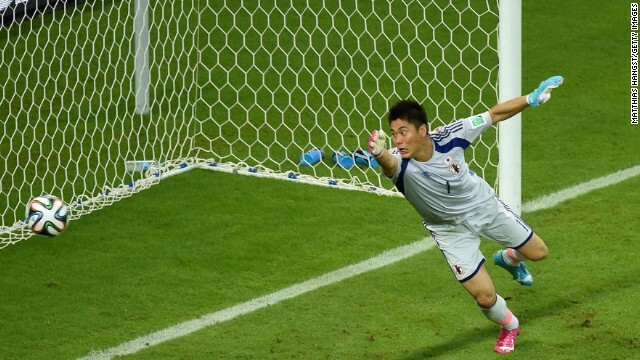 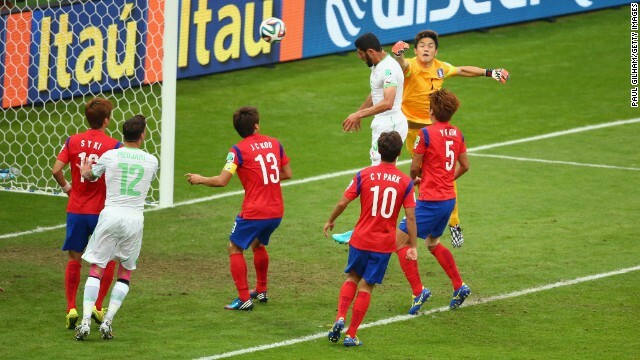 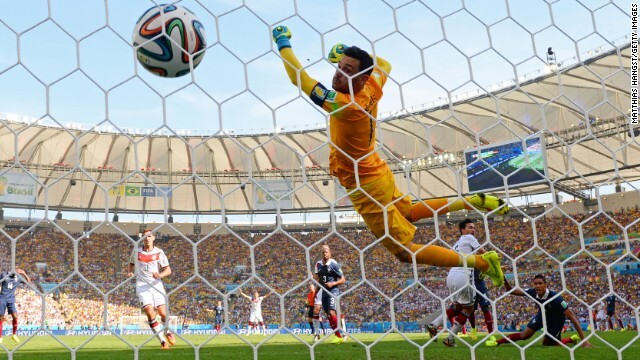 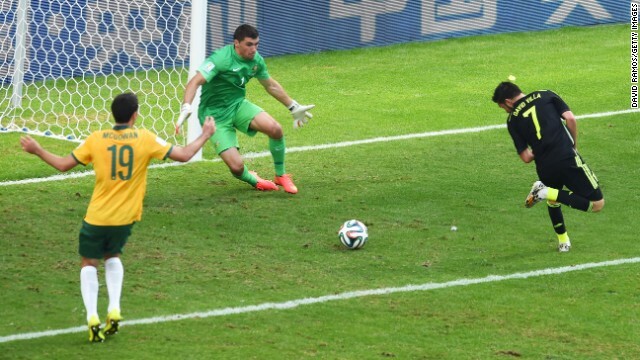 Japan's goalkeeper Eiji Kawashima fails to stop Colombia from scoring. 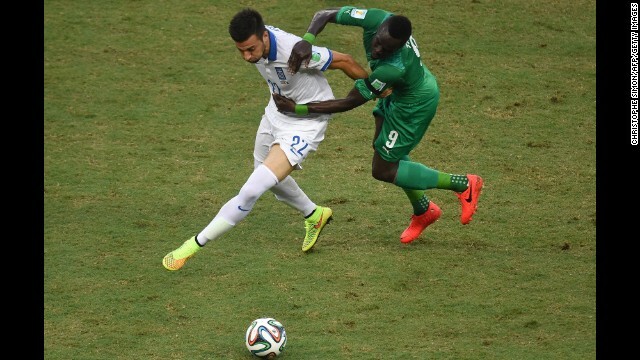 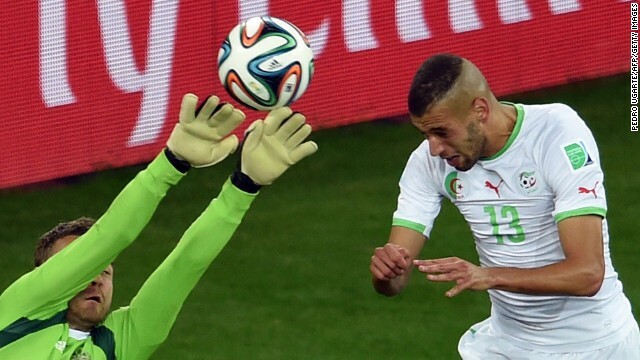 Greece's Andreas Samaris, left, fights for the ball with Ivory Coast's Ismael Cheick Tiote. 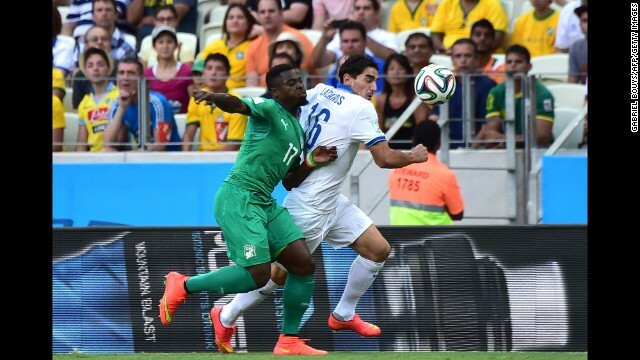 Ivory Coast's Serge Aurier, left, challenges Greece's Lazaros Christodoulopoulos. 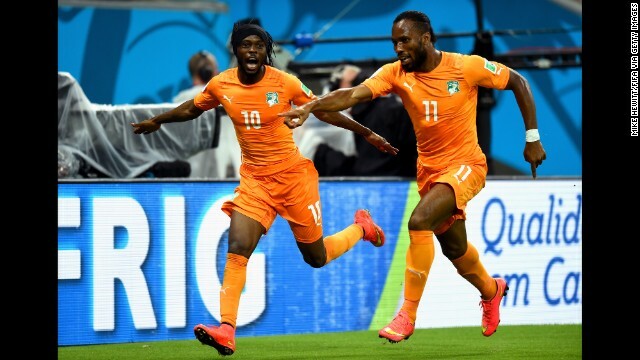 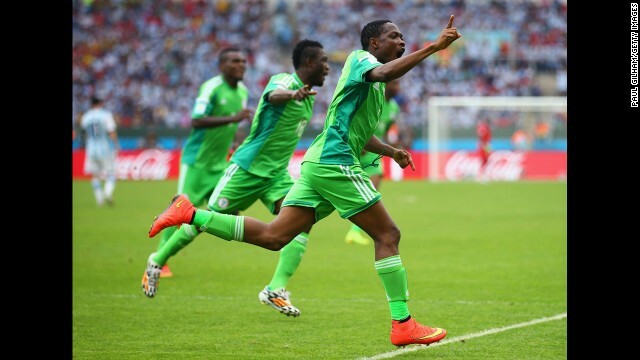 Didier Drogba of the Ivory Coast reacts during the game. 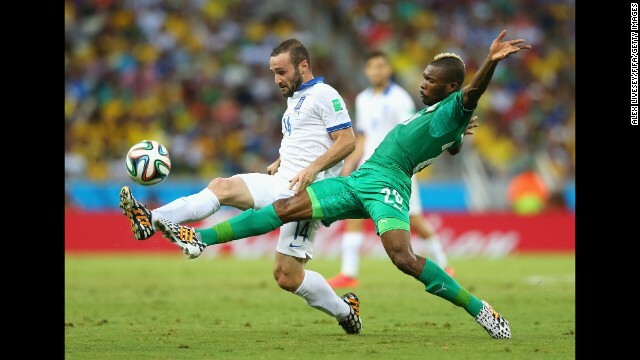 Dimitris Salpingidis of Greece, left, and Die Serey of the Ivory Coast compete for the ball. 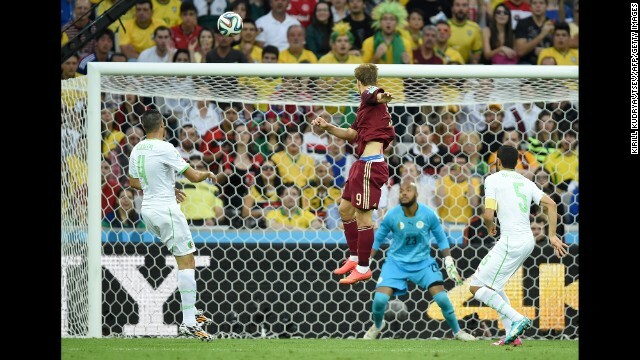 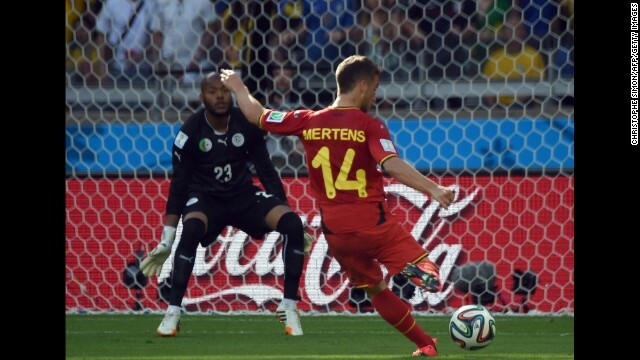 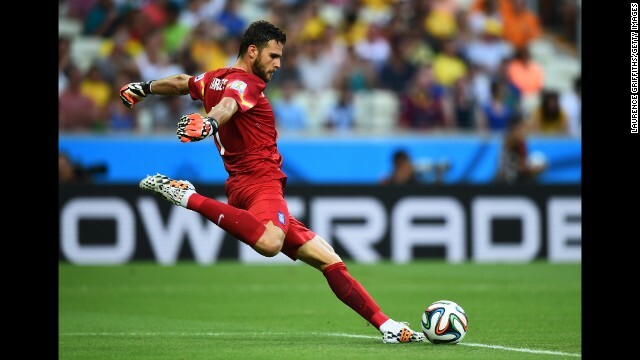 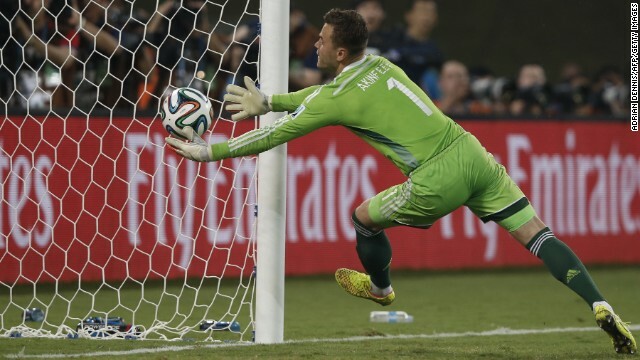 Orestis Karnezis of Greece takes a goal kick against the Ivory Coast. 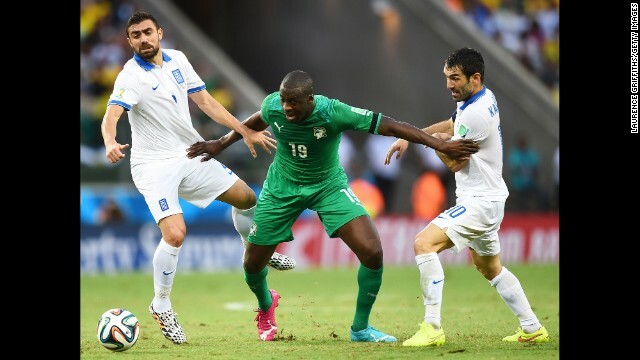 Yaya Toure of the Ivory Coast is challenged by Giannis Maniatis, left, and Giorgos Karagounis of Greece. 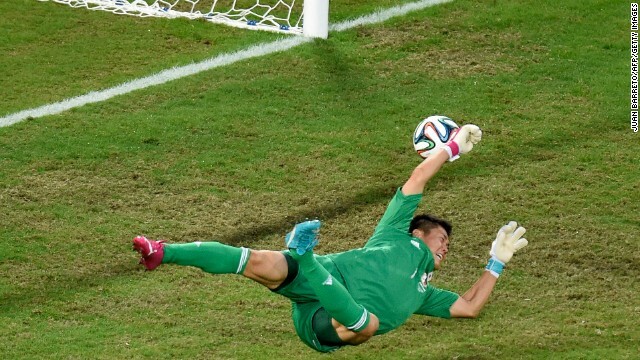 Colombia's Carlos Valdes, left, vies for the ball with Japan's Shinji Okazaki during a World Cup match in Cuiaba, Brazil. 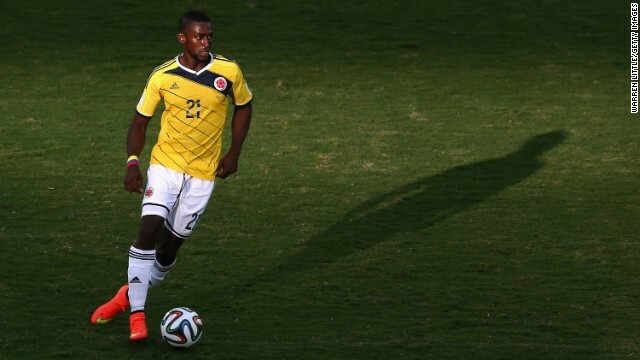 Jackson Martinez of Colombia controls the ball. 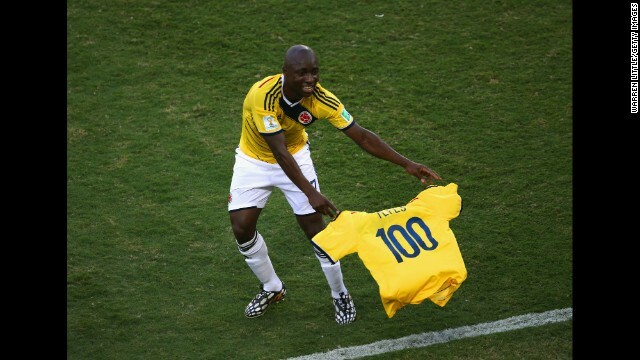 Pablo Armero of Colombia holds up a shirt with the number 100 during the match against Japan. 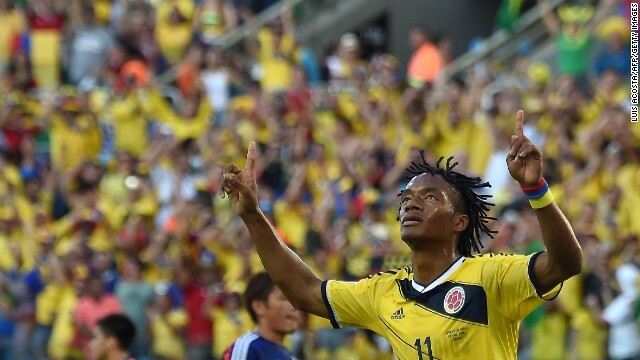 Colombia's Juan Guillermo Cuadrado celebrates after scoring a penalty. 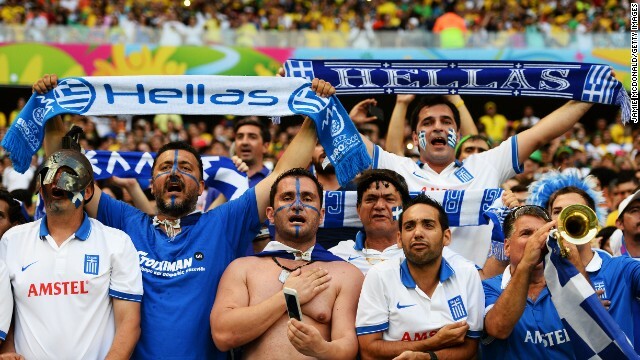 Greece fans cheer during the game against the Ivory Coast. 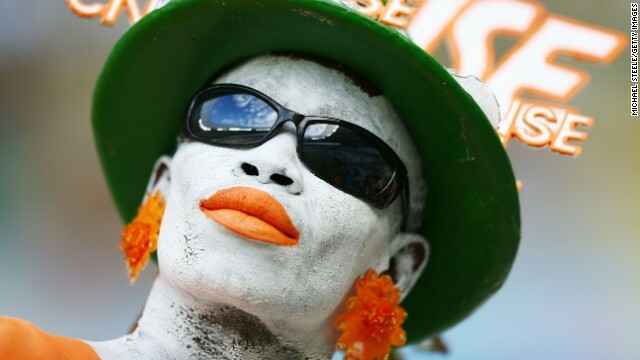 An Ivory Coast fan enjoys the atmosphere prior to kickoff. 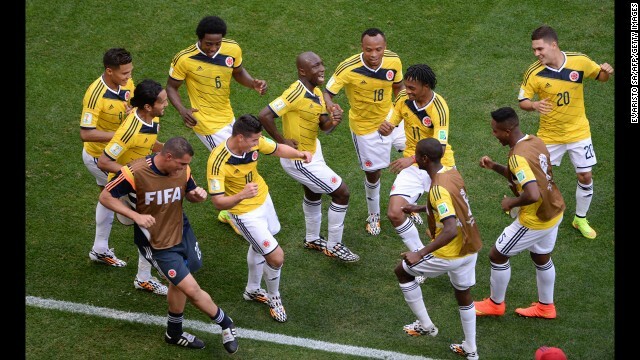 Colombia fans blow kisses during the game against Japan. 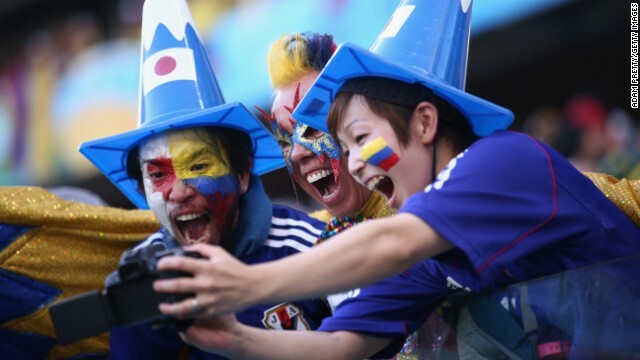 Colombia and Japan fans pose together for a selfie. 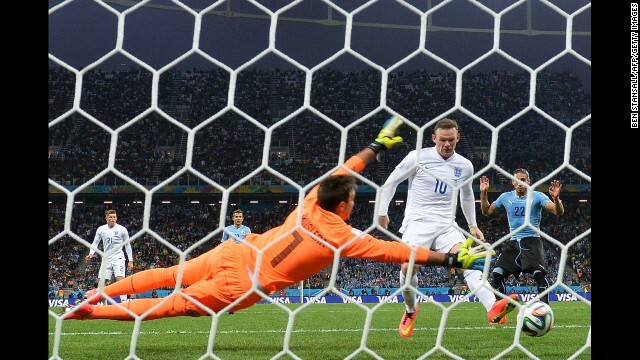 Diego Godin of Uruguay, left, celebrates scoring his team's first goal during a match against Italy in Natal, Brazil. 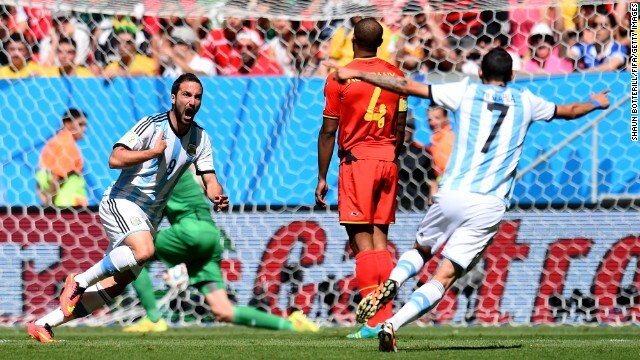 Uruguay won 1-0. 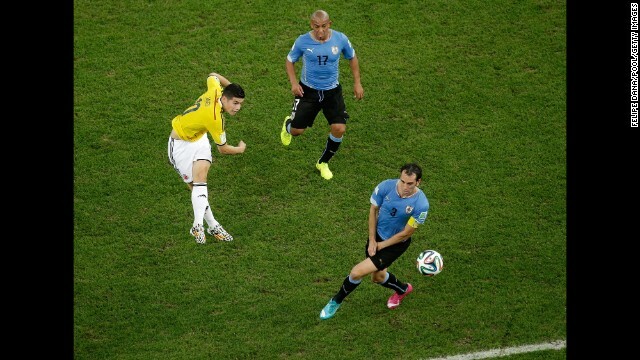 Uruguay defender Diego Godin, third left, scores. 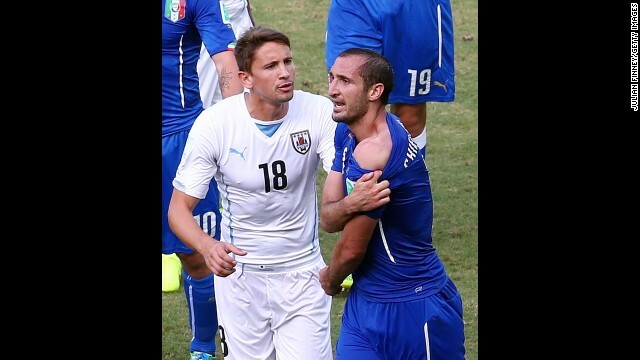 Giorgio Chiellini of Italy pulls down his shirt after a clash with Luis Suarez (not pictured), contending that the Uruguay player bit him. 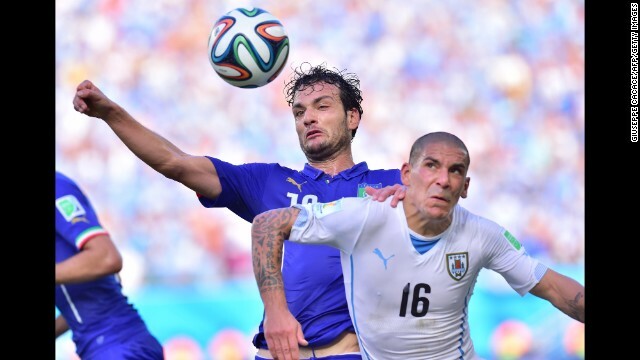 Italy's Marco Parolo, left, and Uruguay's Maximiliano Pereira vie for the ball. 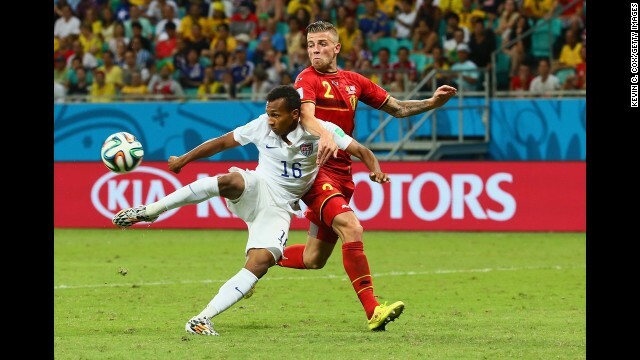 Adam Lallana of England is challenged by Oscar Duarte of Costa Rica during a match at Estadio Mineirao in Belo Horizonte. 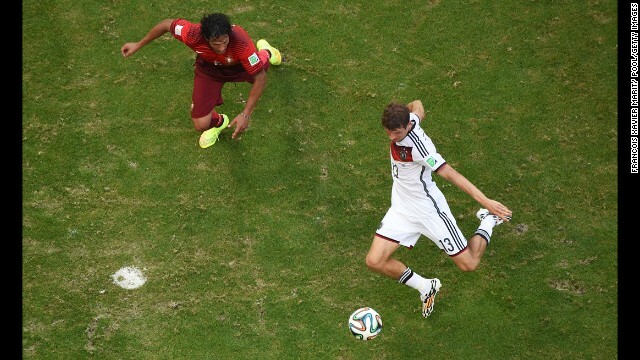 The game ended in a 0-0 draw. 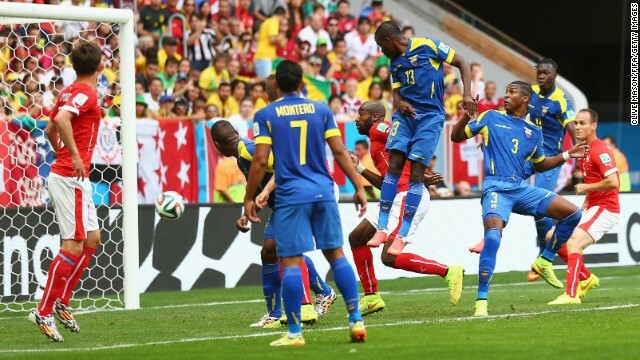 Bryan Ruiz of Costa Rica competes for the ball with Ross Barkley, left, and Adam Lallana of England. 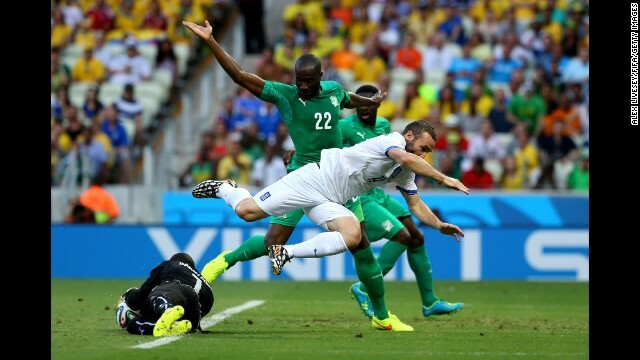 England forward Wayne Rooney, right, reacts after a challenge from Costa Rica defender Junior Diaz. 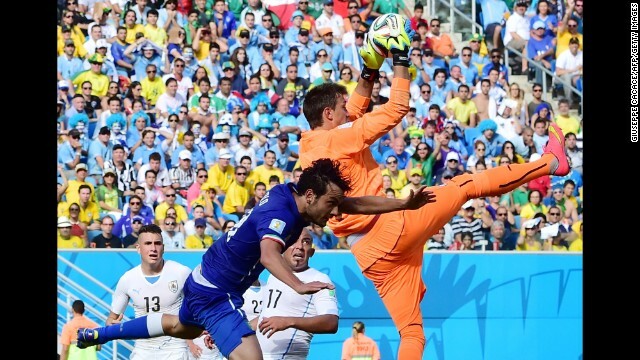 Uruguay goalkeeper Fernando Muslera grabs the ball away from Italy's Marco Parolo. 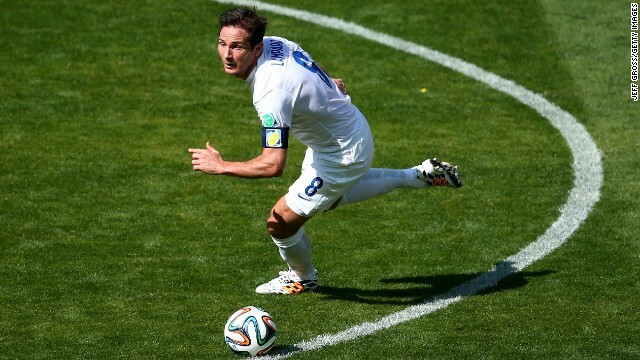 Frank Lampard of England controls the ball during the match against Costa Rica. 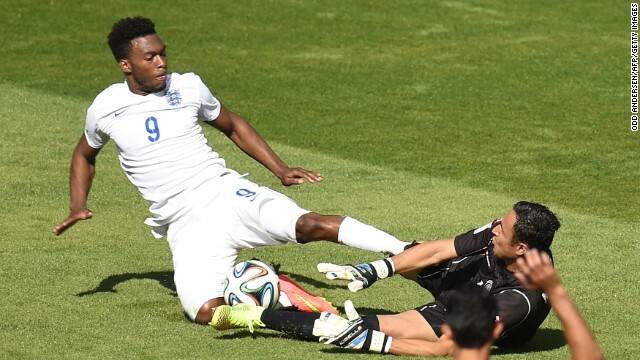 England forward Daniel Sturridge, left, challenges Costa Rica goalkeeper Keylor Navas. 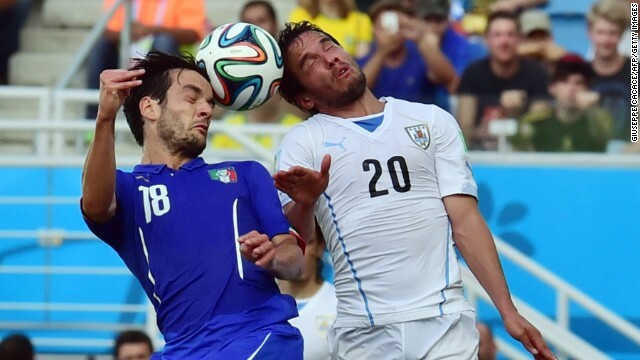 Italy midfielder Marco Parolo, left, and Uruguay midfielder Alvaro Gonzalez vie during a match at the Dunas Arena in Natal. 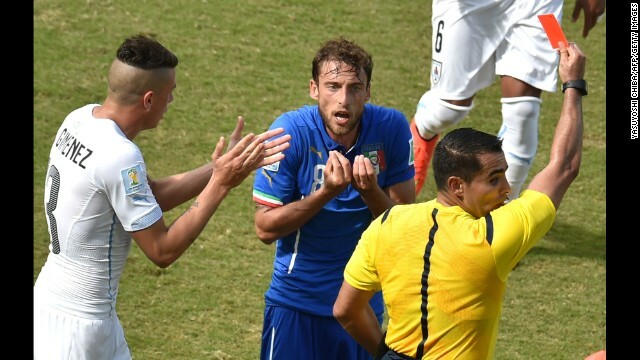 Italy midfielder Claudio Marchisio, center, reacts as he is shown a red card by referee Marco Antonio Rodriguez Moreno. 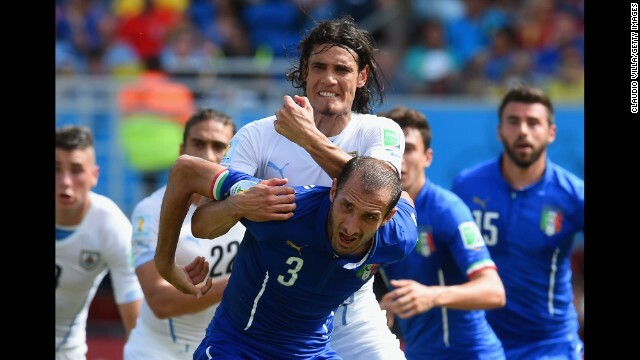 Giorgio Chiellini of Italy and Edinson Cavani of Uruguay tussle. 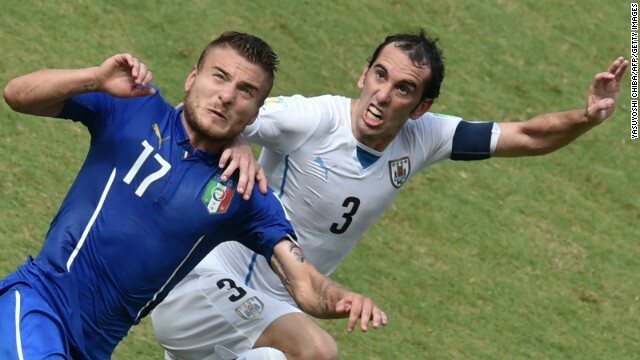 Italy forward Ciro Immobile, left, vies with Uruguay defender Diego Godin. 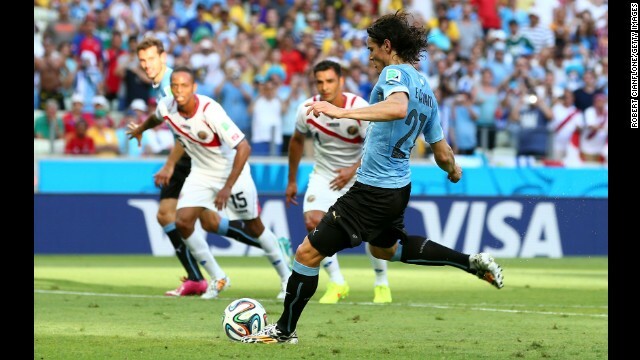 Uruguay's Edinson Cavani, left, is fouled by Italy's Leonardo Bonucci in the penalty area. 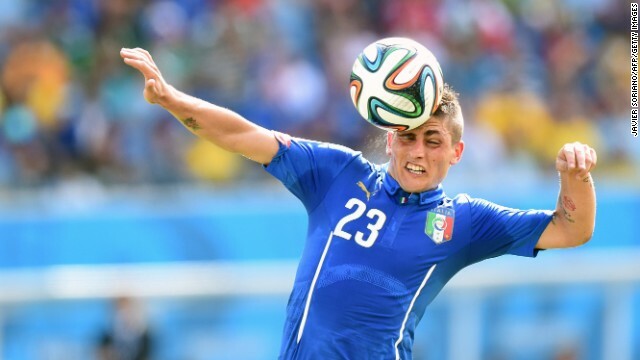 Midfielder Marco Verratti of Italy heads the ball. 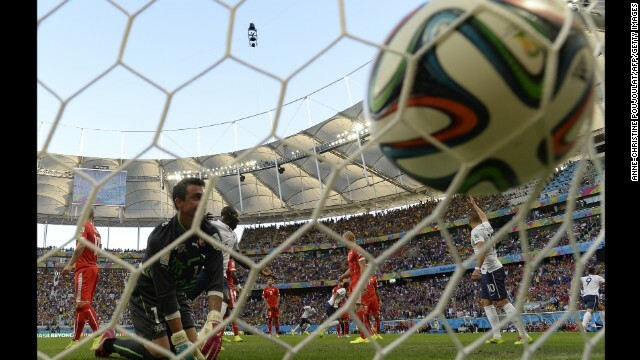 England goalkeeper Ben Foster leaps to catch the ball during the match between Costa Rica and England. 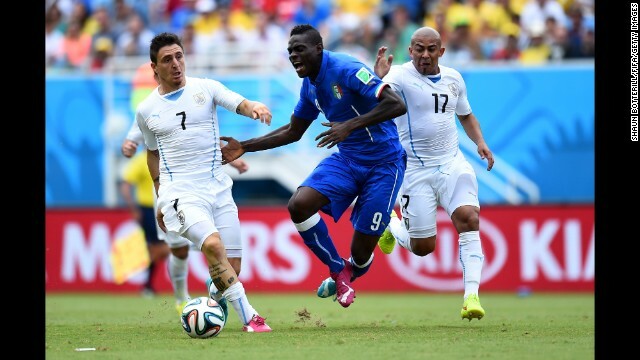 Mario Balotelli of Italy competes for the ball against Cristian Rodriguez, left, and Egidio Arevalo Rios, right, of Uruguay. 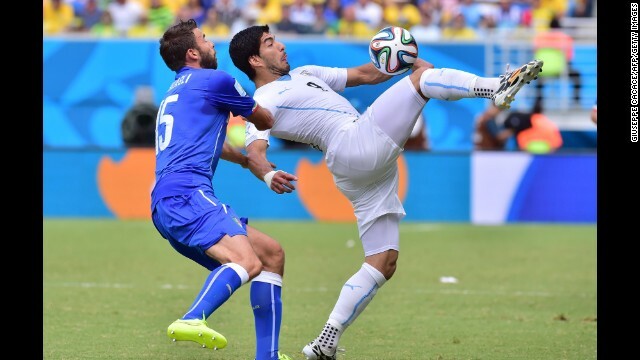 Italy defender Andrea Barzagli, left, and Uruguay forward Luis Suarez vie for the ball. 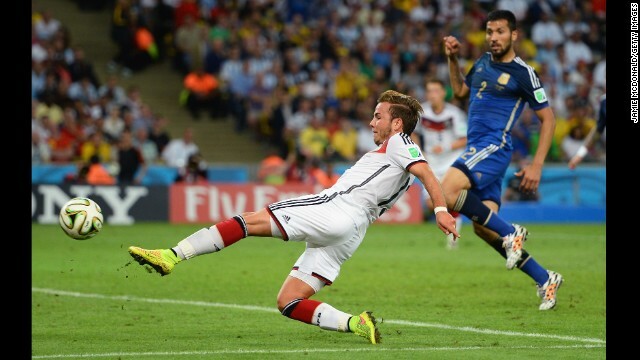 Diego Godin of Uruguay and Ciro Immobile of Italy compete for the ball. 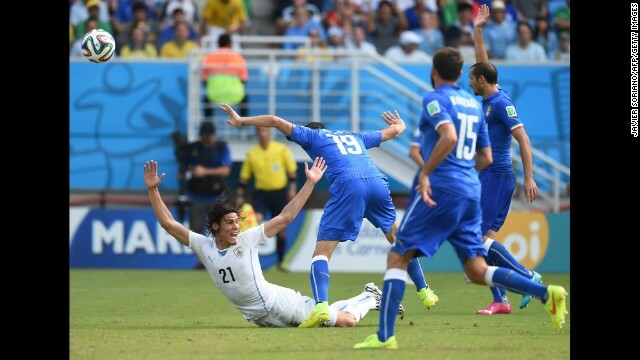 Luis Suarez of Uruguay reacts during a fall. 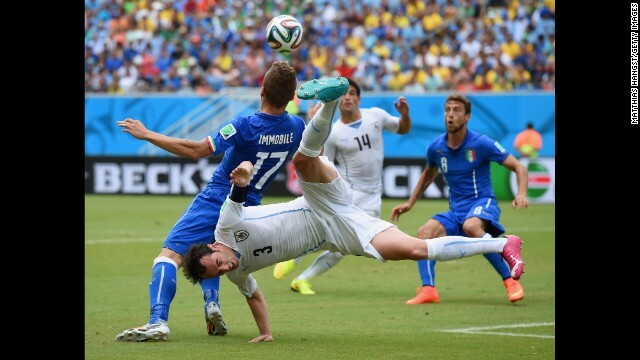 Andrea Barzagli of Italy challenges Luis Suarez of Uruguay. 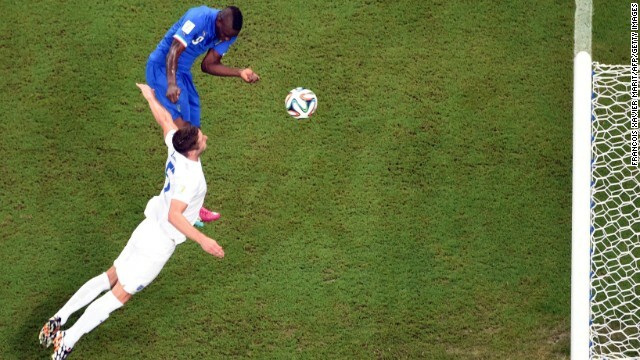 Marco Verratti of Italy tackles Cristian Rodriguez of Uruguay. 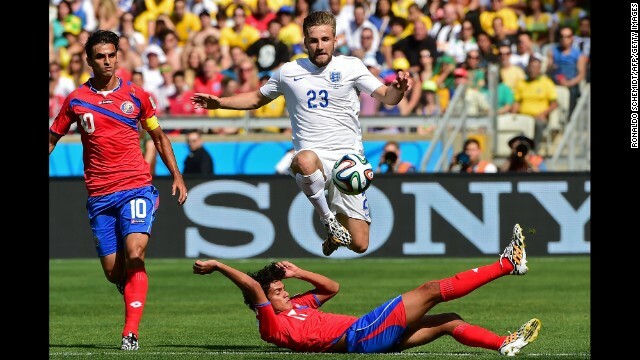 England defender Luke Shaw jumps over a Costa Rica player while going after the ball. 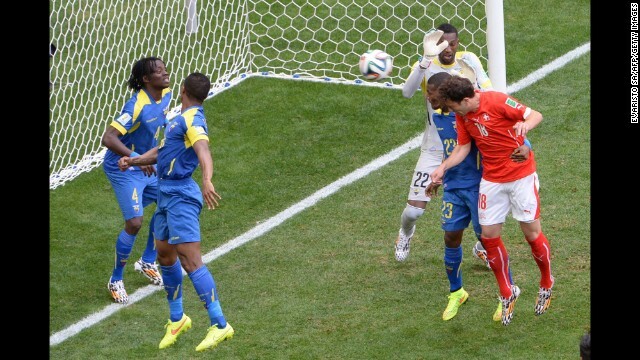 England midfielder Adam Lallana, right, vies for the ball against Costa Rica forward Bryan Ruiz. 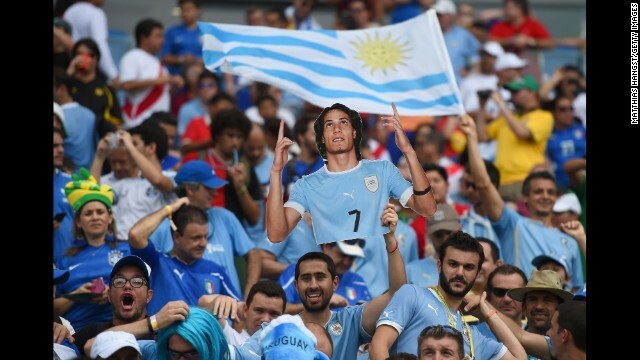 A Uruguay fan holds a cutout of Cristian Rodriguez ahead of the match against Italy. 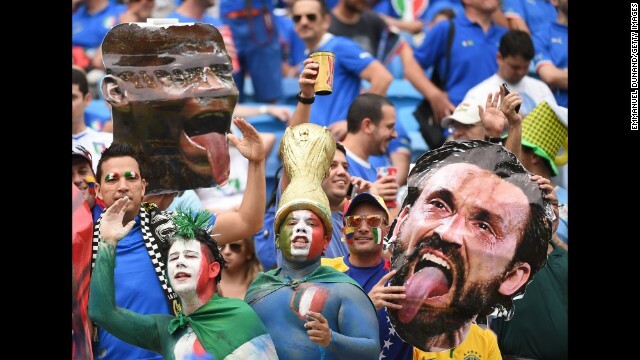 Italy fans hold up cardboard cutouts of forward Mario Balotelli, left, and midfielder Andrea Pirlo. 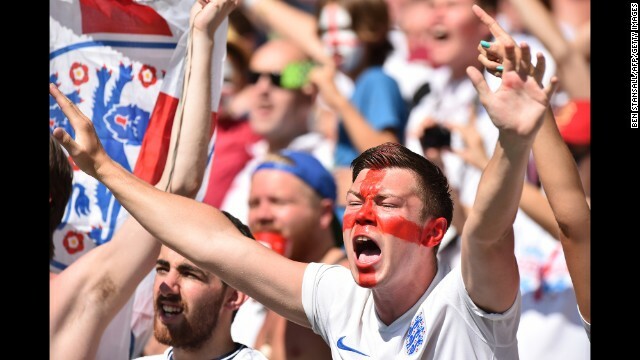 England supporters cheer for their team before the match against Costa Rica. 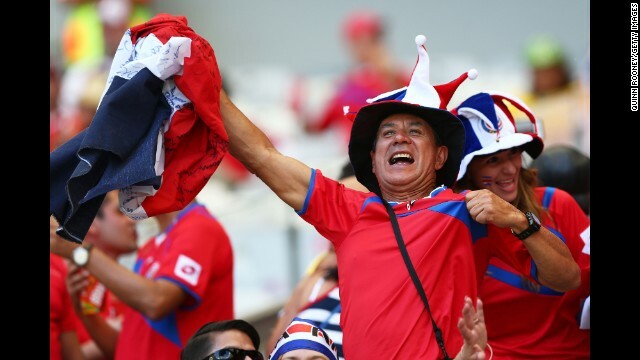 A Costa Rica fan enjoys the atmosphere prior to the match against England. 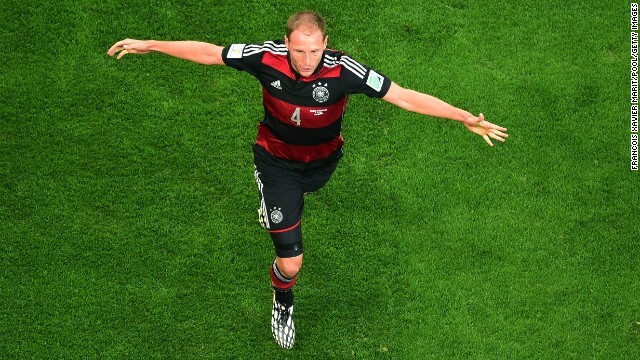 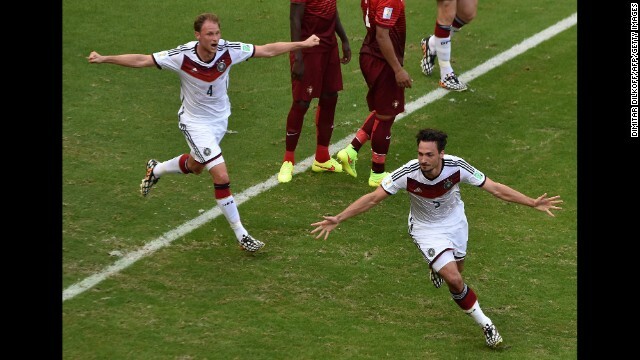 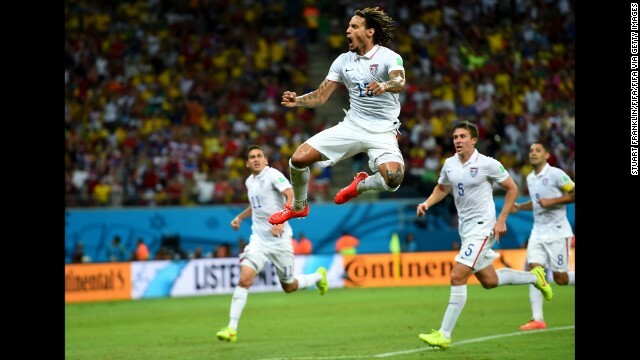 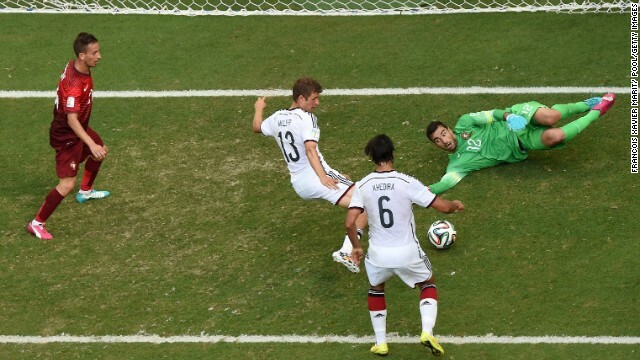 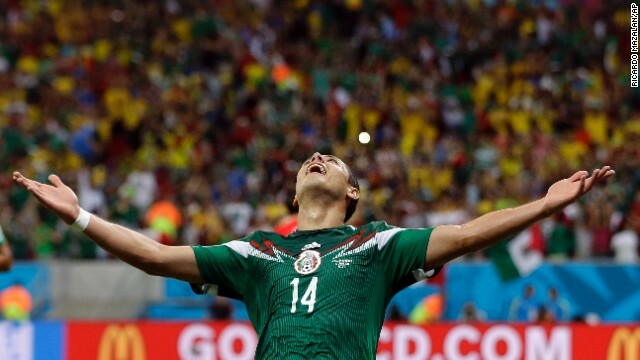 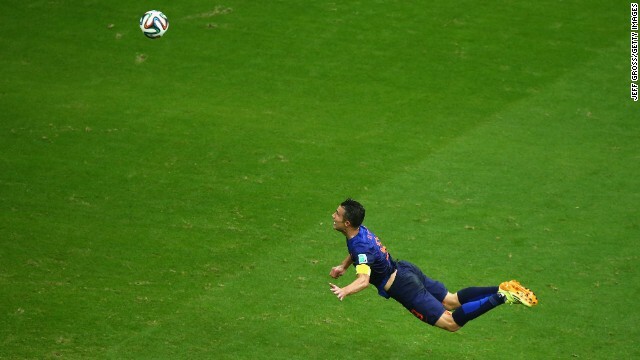 See the best World Cup photos from June 23. 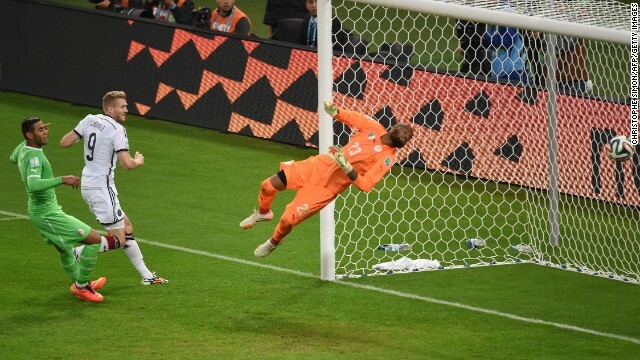 Striker Luis Suarez was his usual, tricky self in Uruguay's must-win clash with Italy, forcing goalkeeper Gianluigi Buffon into a fine save from this powerful shot in the second half. 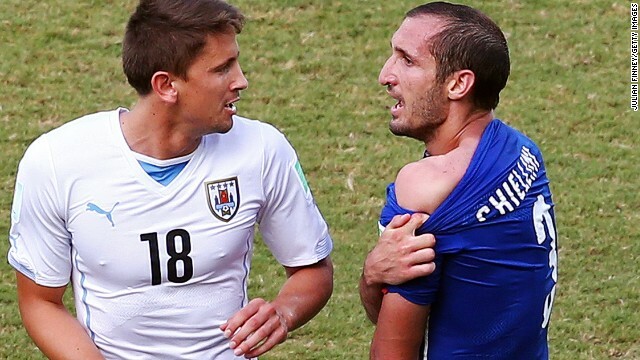 But the game will be remembered for Suarez's clash with defender Giorgio Chiellini, who claimed he had been bitten by the Uruguay striker. 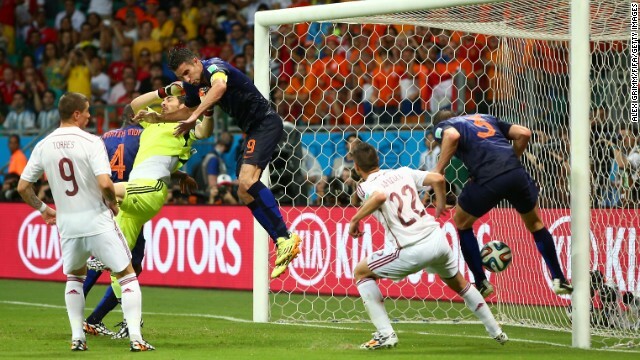 Suarez has previous on the biting front, having been banned for similar incidents in Holland and in England. 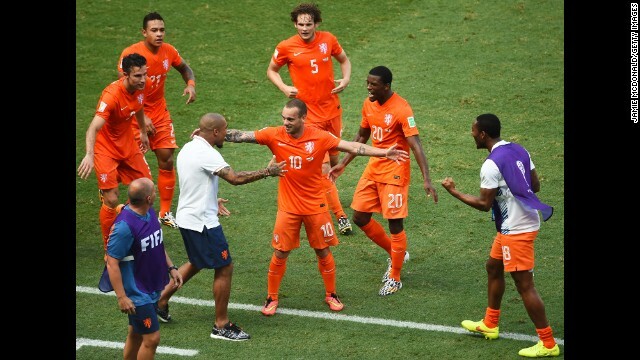 Players from both sides react after the incident. 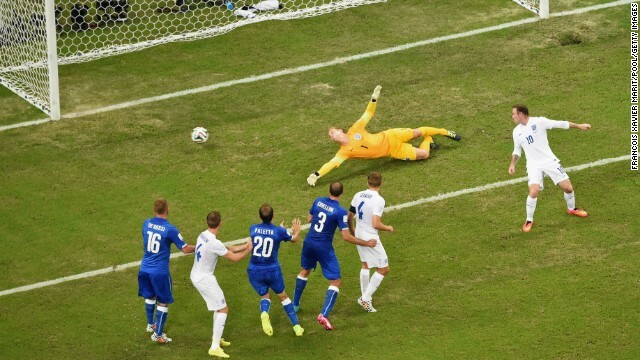 Chiellini later told Rai TV: "It was ridiculous not to send Suarez off. 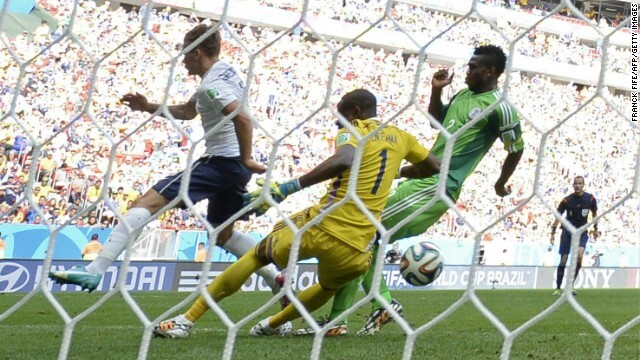 It is clear." 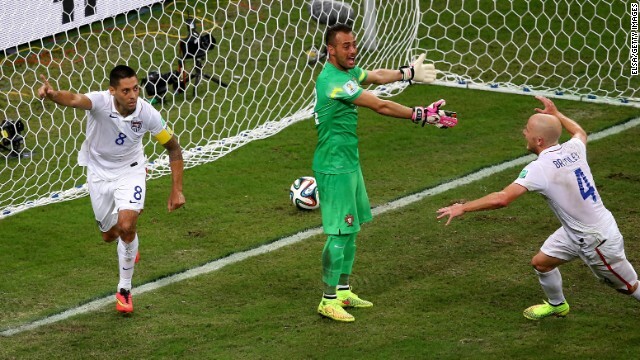 Chiellini attempts to show the referee the mark left by Suarez's alleged bite. 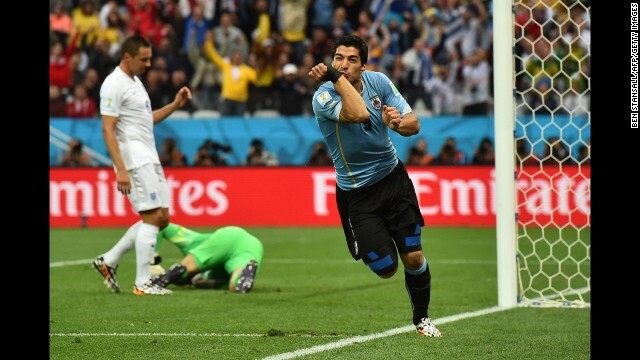 Suarez celebrates as Uruguay booked their place in the last 16 thanks to a 1-0 win, secured by Diego Godin's header. 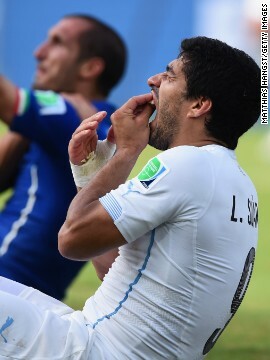 Did Suarez take a bite? 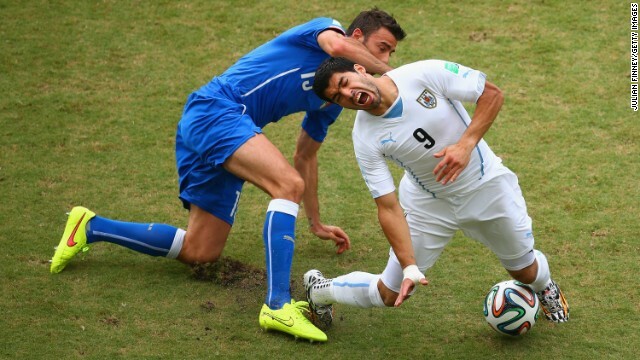 Uruguay striker Luis Suarez, who plays his club football with Liverpool, has been accused of biting Italy defender Giorgio Chiellini during a World Cup match on Tuesday, June 24. 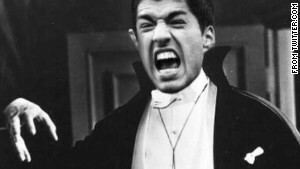 Suarez has already been banned twice in his career for biting. 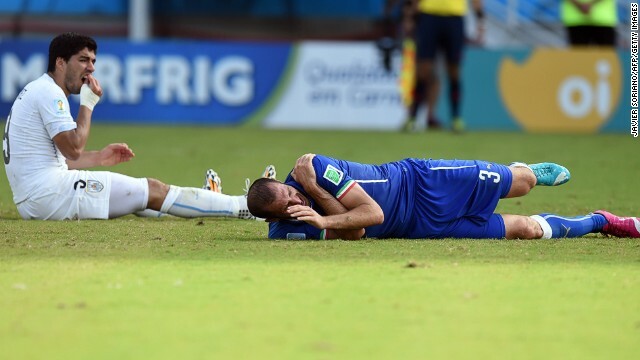 Television pictures showed Suarez dipping his head towards Chiellini, right, and when the Italian defender eventually got up, he pulled down his shirt and appeared to furiously indicate that he had been bitten on the shoulder. 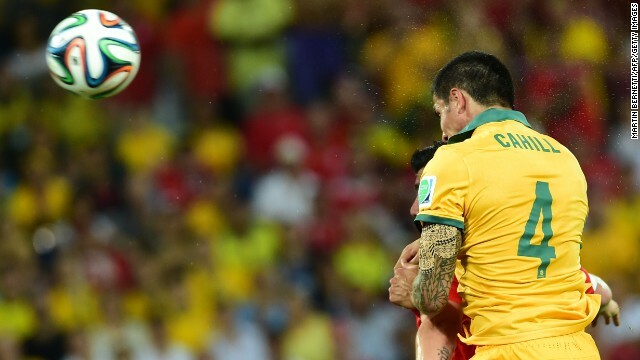 "I just collided with his shoulder. 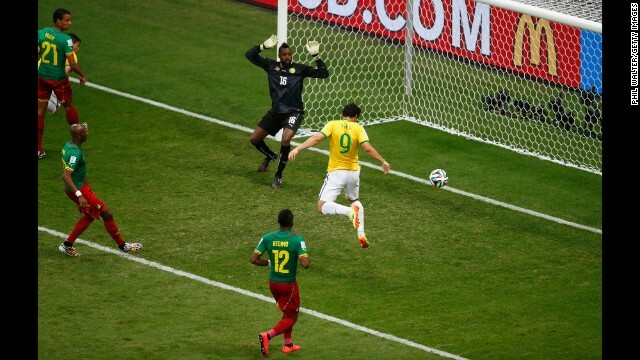 They are just casual incidences that occur during a soccer game," Suarez told reporters. 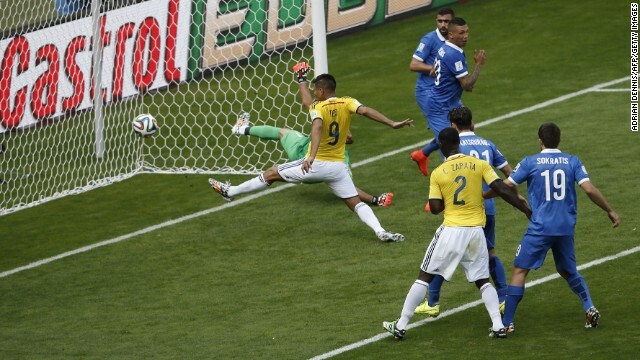 Suarez holds his mouth as Chiellini sits in the background. 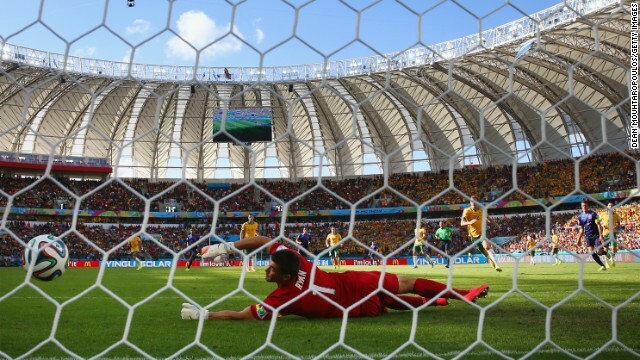 Suarez will now face a nervous wait to find out if football's world governing body FIFA will take action retrospectively -- given it was missed by the match officials -- and punish him. Chiellini shows an apparent bite mark on his shoulder. 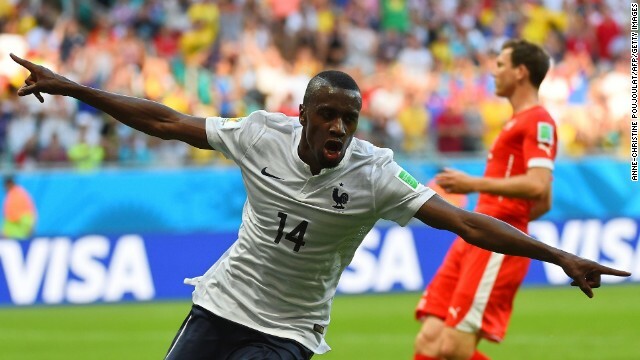 "Suarez is a sneak, and he gets away with it because FIFA want their stars to play in the World Cup," Chiellini told Sky Sports Italia. 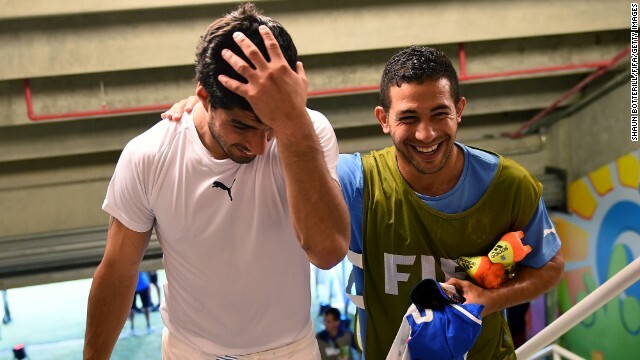 Suarez, left, celebrates the 1-0 win against Italy with his teammate Walter Gargano in the tunnel after the controversial match at Estadio das Dunas. 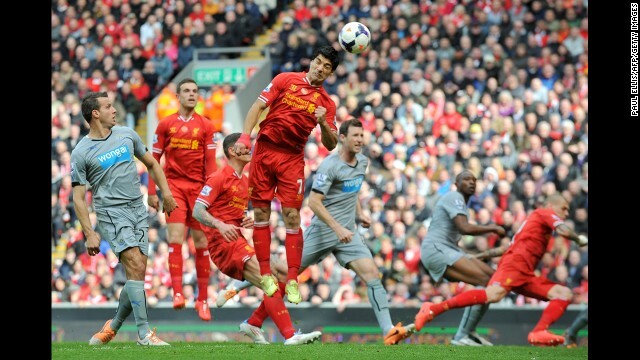 Suarez, fourth from left, heads the ball for teammate Daniel Sturridge to score his team's second goal during the English Premier League football match between Liverpool and Newcastle United on May 11. 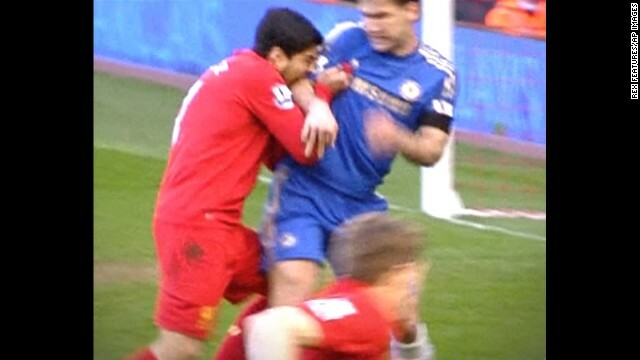 Suarez, left, was banned for 10 games in April 2013 after being found guilty of biting Chelsea defender Branislav Ivanovic during a English Premier League soccer match. 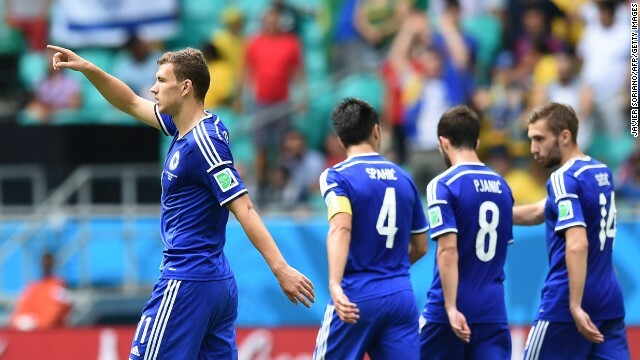 Ivanovic demonstrates the bite he received from Suarez to a referee. 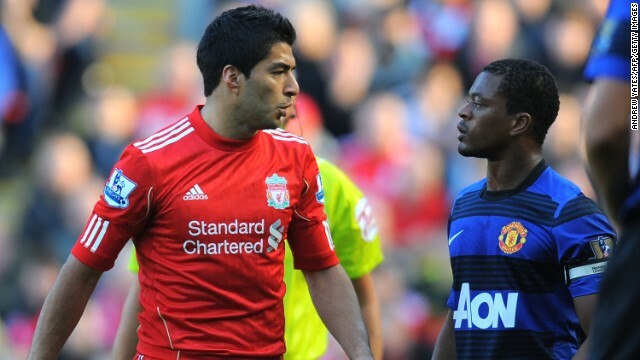 After his move to Liverpool in 2011, Suarez, left, was found guilty of racially abusing Manchester United's Patrice Evra and was fined $63,000 and banned for eight matches. 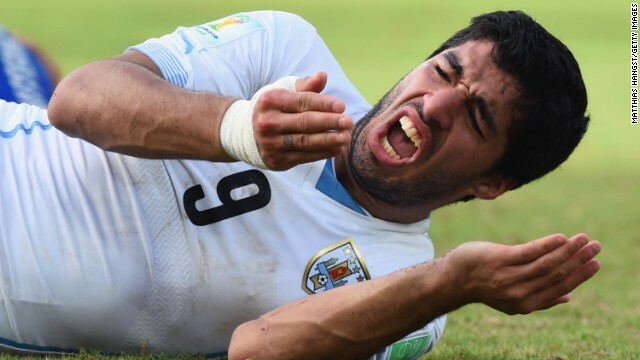 During his time in the Netherlands with Ajax in 2011, Suarez was banned for seven games after leaving a scar on the collarbone of Amsterdam player Otman Bakkal. 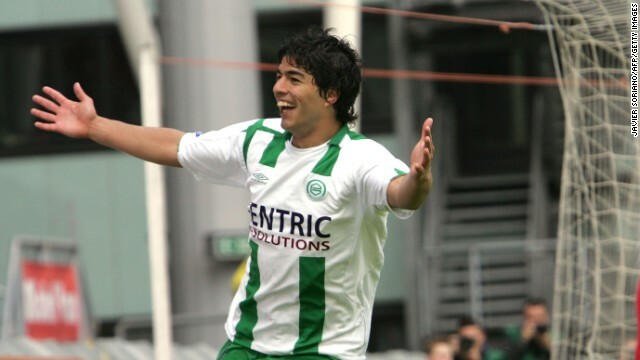 Suarez celebrates a goal during a match between Utrecht and Groningen at Utrecht, Netherlands, in 2007. 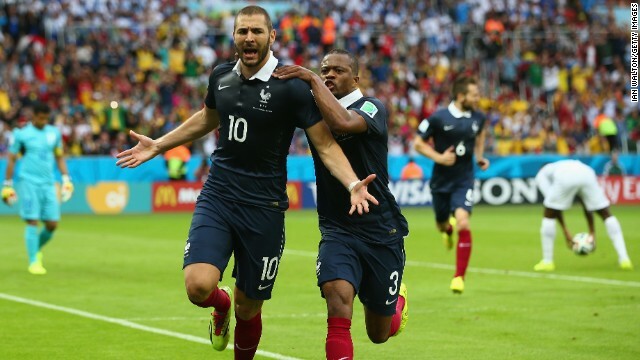 Zinedine Zidane, the former France midfielder, was handed a three-match ban for headbutting Marco Materazzi in the 2006 final. 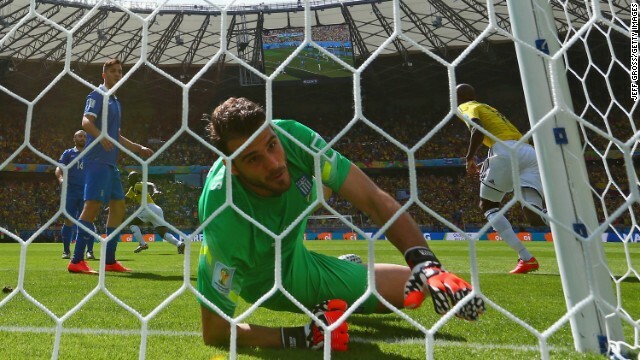 While FIFA has yet to make a decision, Uruguay coach Oscar Tabarez insists he did not see the incident when he addressed the press in his news conference. 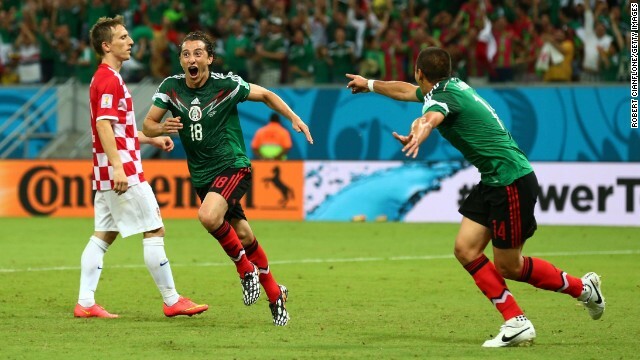 "I'd like to see the images," he said. 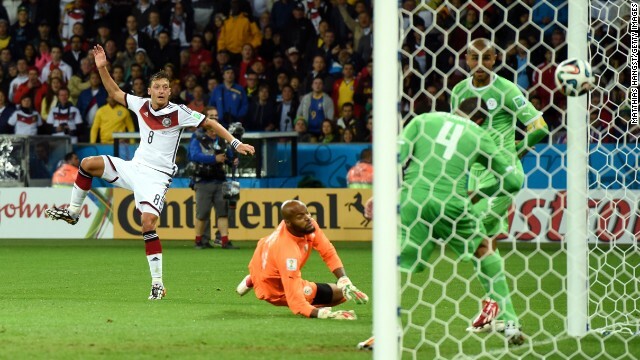 "I didn't see that. 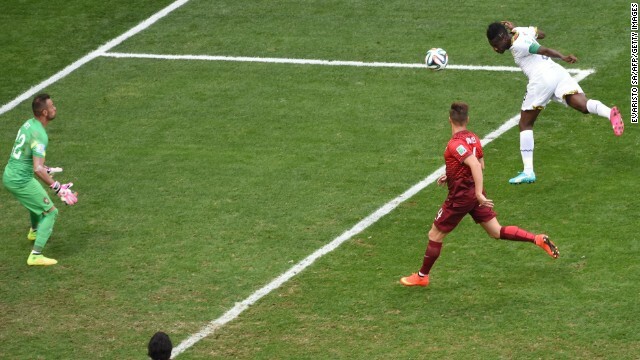 And if it happened the referee probably didn't see it. 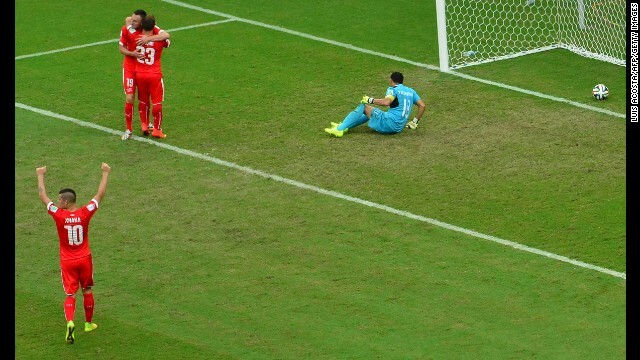 So no I don't have any more comments to make. 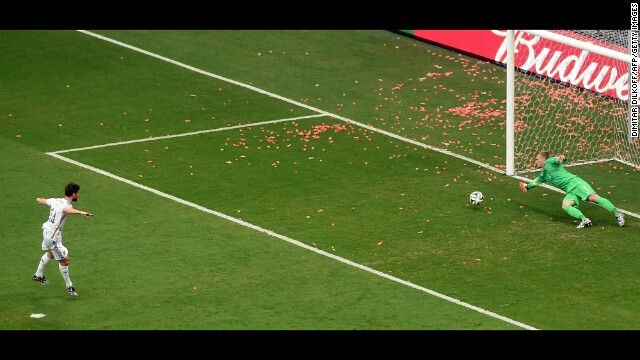 We had more important things than this in a football match. 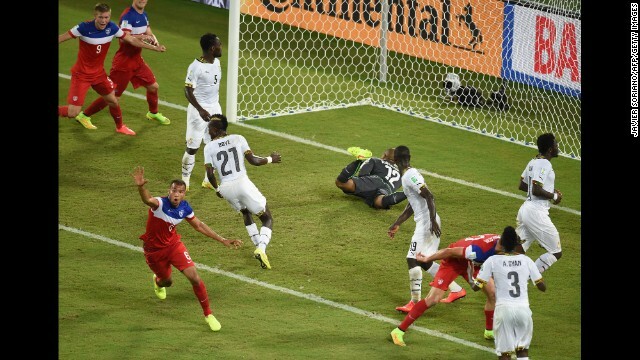 "There seems there is animosity against this football player," he added. 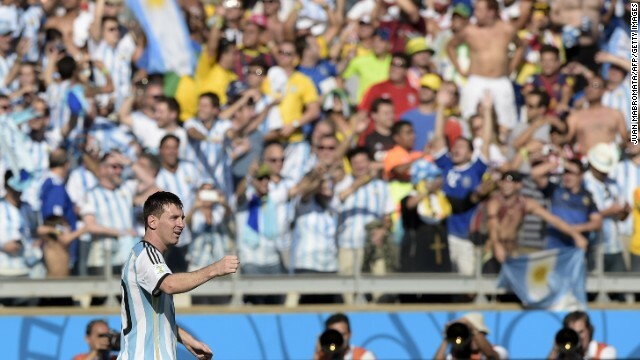 "He just came out of a difficult moment and he has been penalized. 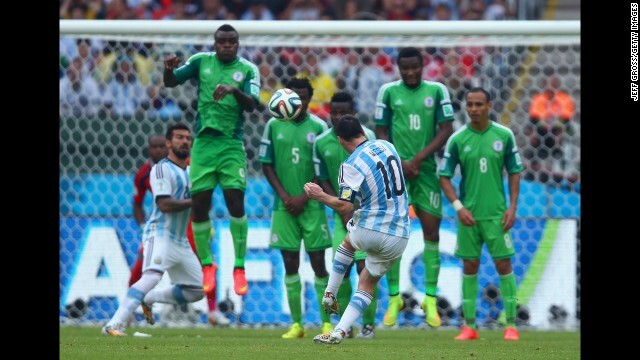 There are people hiding behind the tree waiting for something to happen." 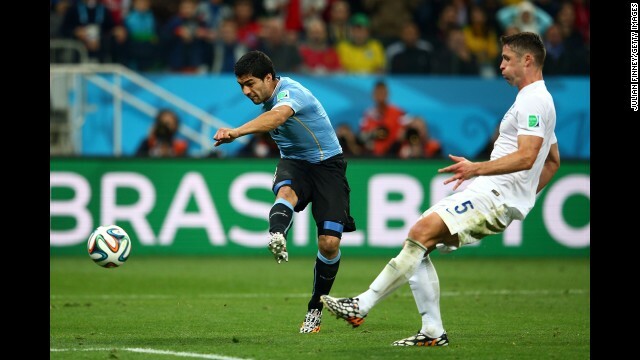 Suarez was also backed by team captain Diego Lugano, who instead blamed Chiellini for exaggerating the entire episode. 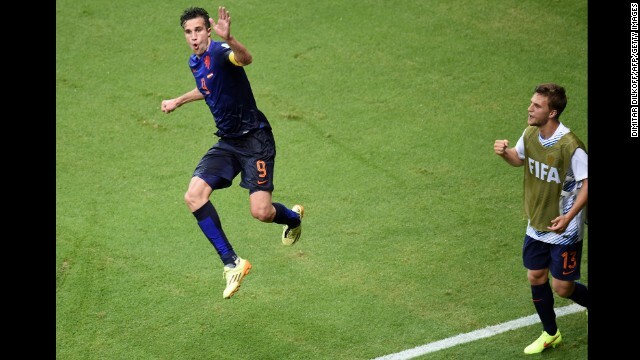 When asked by reporters about the incident he said: "You saw this, really? 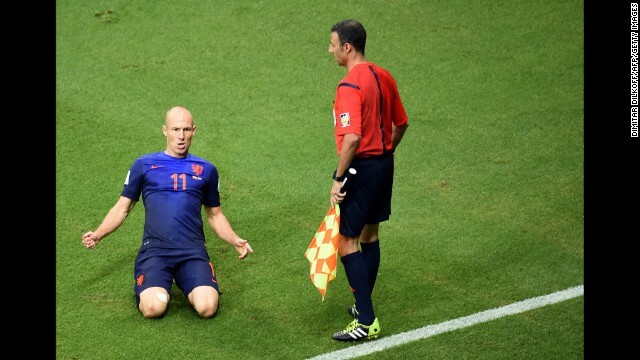 "You need to show me because I didn't see anything. 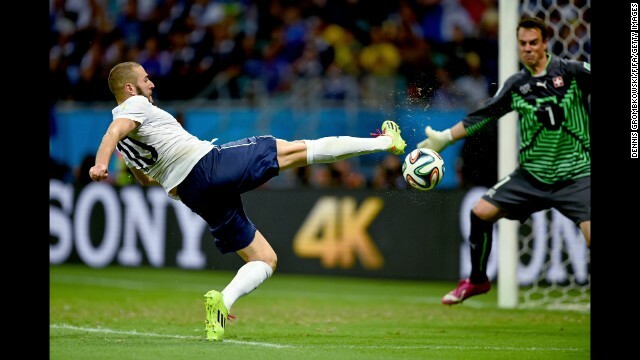 "The worst of everything is the attitude of Chiellini. 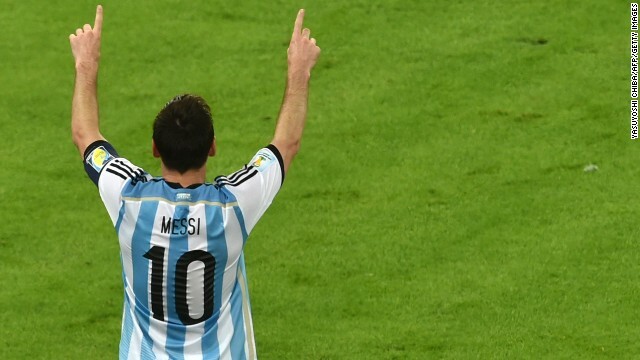 He's a great player, with an enormous status. 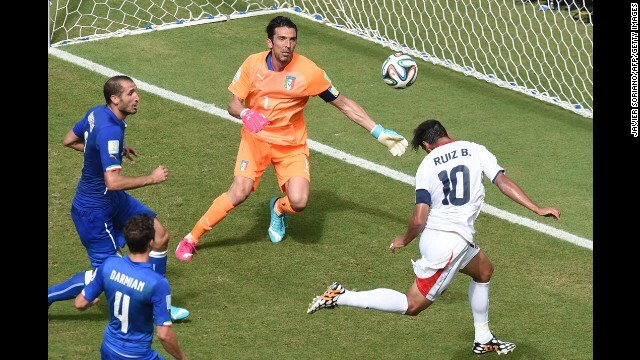 It doesn't correspond with Italian football. 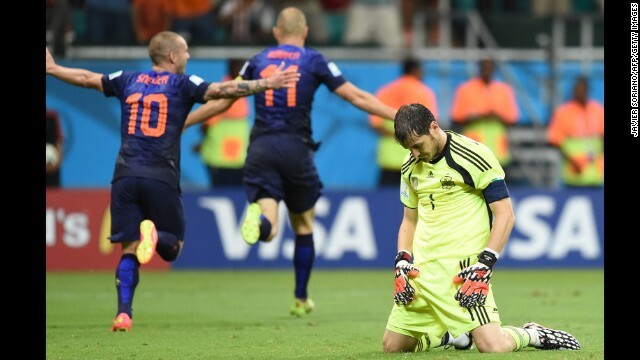 As sportsmen leaving the field, crying and appealing against a rival. 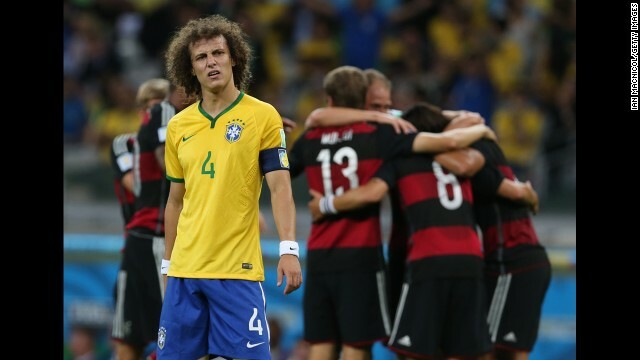 As a man he disappointed me totally." 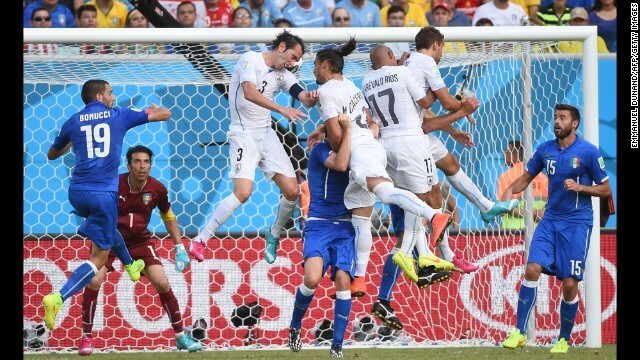 Diego Godin's 81st minute header secured victory for Uruguay against an Italian team which played the final half hour with 10-men after Claudio Marchisio was sent off. 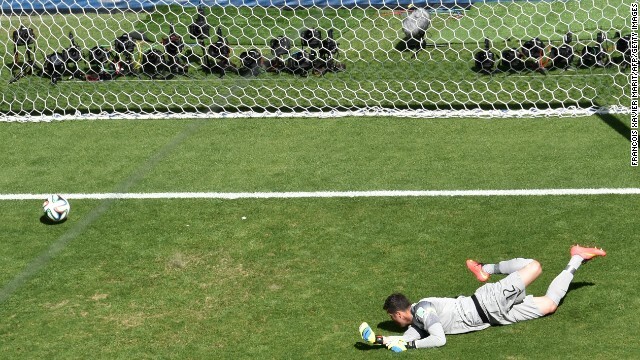 The defeat led to Italian coach Cesare Prandelli offering his resignation in his news conference after the game -- but all eyes were still on Suarez. 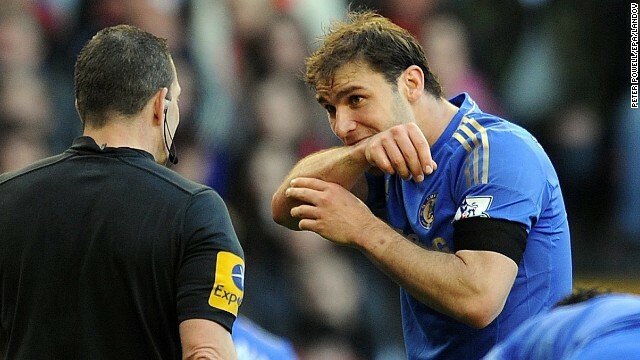 The Uruguayan, who plays his club football with Liverpool, was banned for 10 games in April 2013 after being found guilty of biting Chelsea defender Branislav Ivanovic. 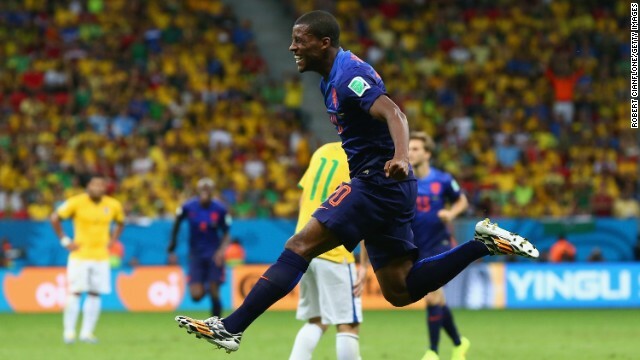 He was also guilty of biting during his time in the Netherlands with Ajax where he was banned for seven games after leaving a scar on the collarbone of Otman Bakkal. 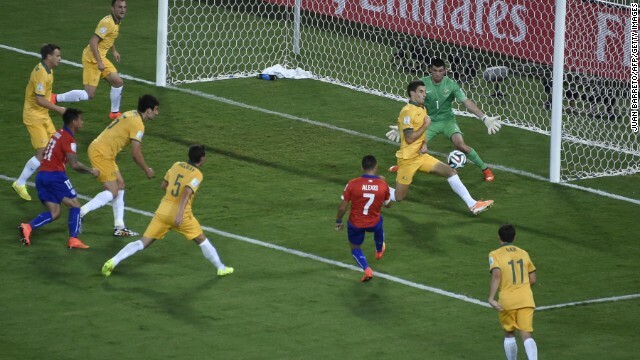 Suarez's rap sheet is lengthy. 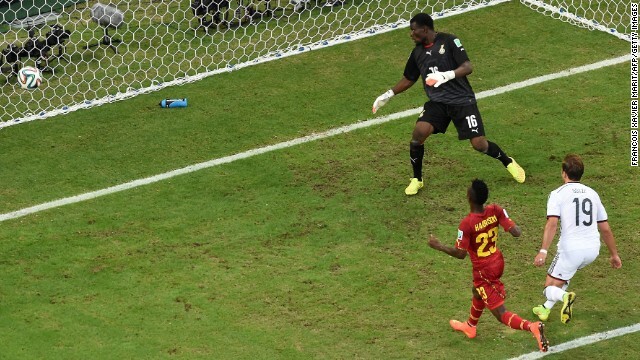 At the 2010 World Cup in South Africa, he deliberately handled the ball on the goal-line to deny Ghana a place in the semifinals of the World Cup. 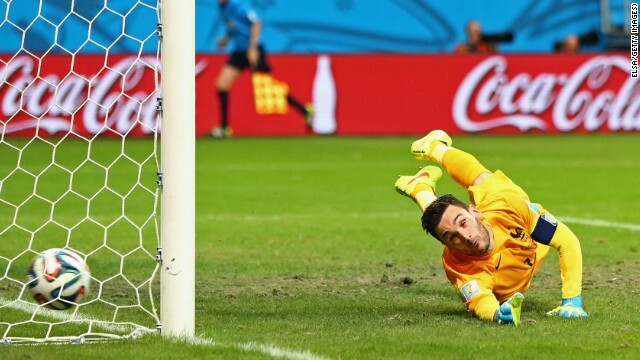 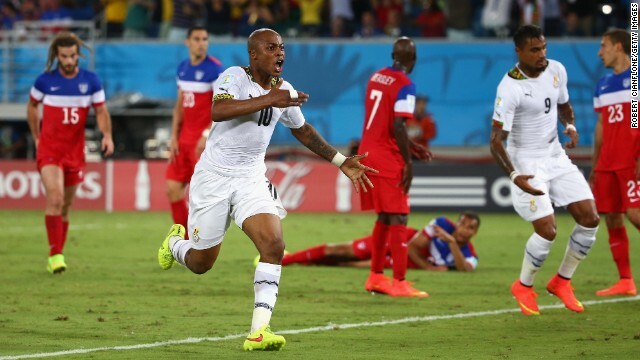 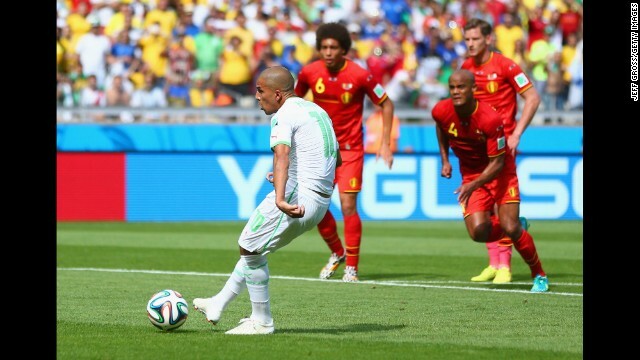 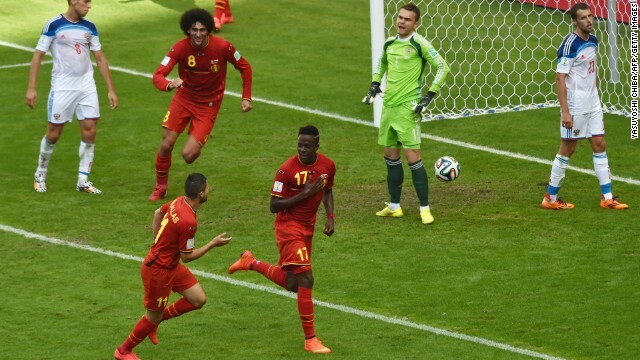 He was sent off for his troubles but Ghana missed the penalty and Uruguay went on to finish fourth in the tournament. 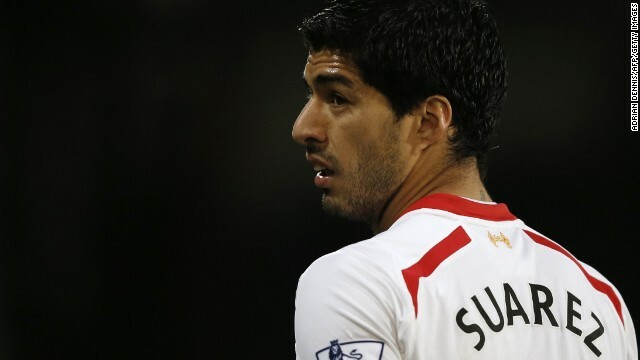 The following year after his move to Liverpool, Suarez was found guilty of racially abusing Manchester United's Patrice Evra. 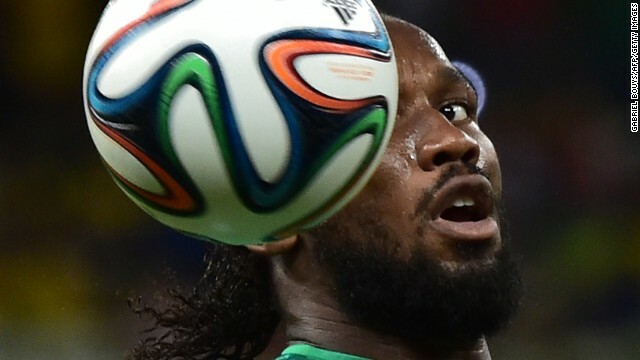 He was fined $63,000 and banned for eight matches. 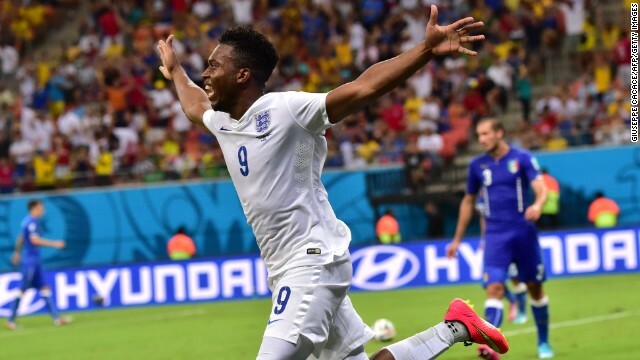 Last week, after scoring both goals in his side's 2-1 victory over England, Suarez hit out at the British media after claiming he had been unfairly treated over his transgressions. 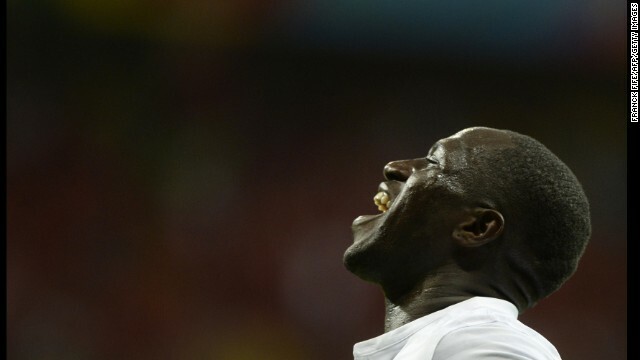 "Before the game people in England laughed about my attitude over the last few years," he told reporters following the game. 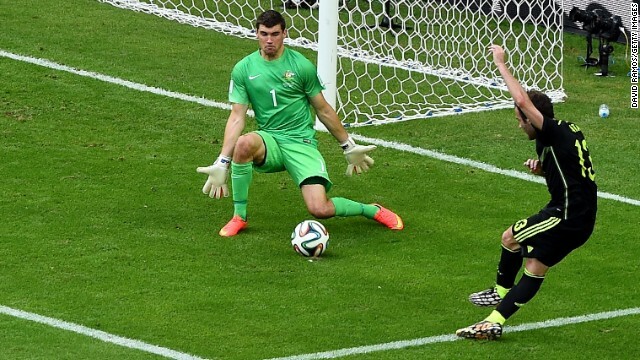 "I want to see what they think now. 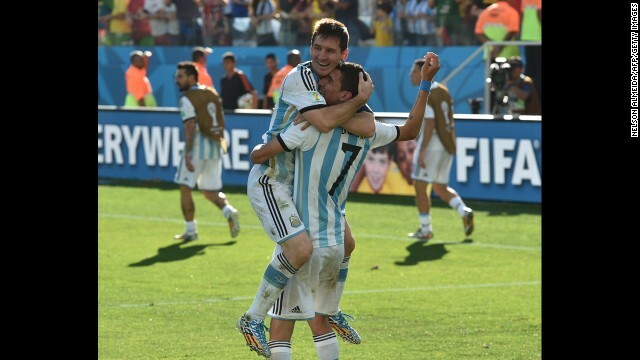 I have dreamed of this moment." 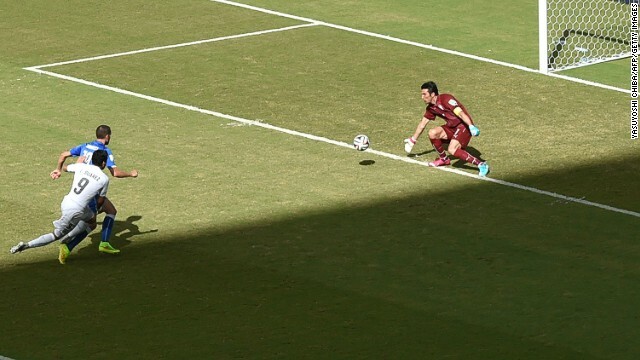 Suarez enjoyed a sensational season with Liverpool -- scoring 31 league goals to help his club qualify for the Champions League. 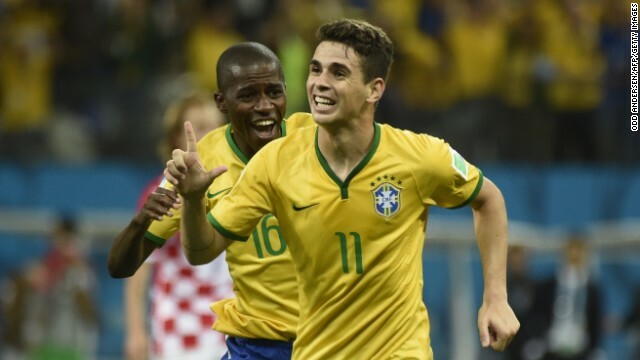 He was voted Player of the Year by his fellow colleagues and also named as the journalists' Player of the Year too -- awards that reflected a feeling that Suarez had put behind him his troubled past. 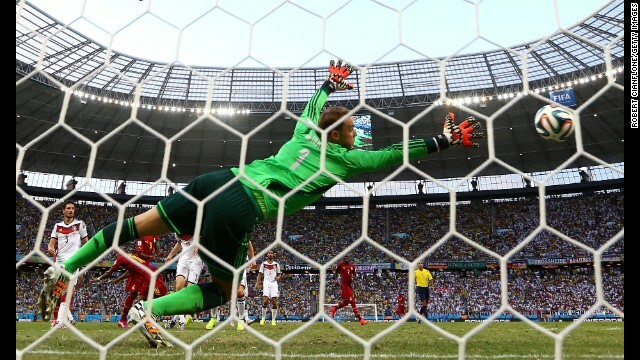 His participation in the World Cup had looked in danger when he suffered a knee injury in Liverpool's final game of the season. 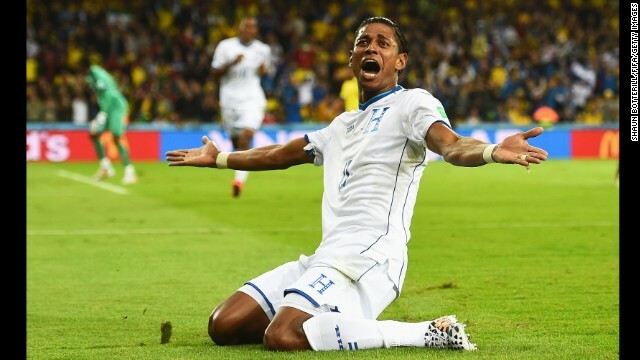 He was forced to undergo keyhole surgery and missed Uruguay's opening game defeat by Costa Rica before making a near miraculous return in time to face England just five weeks after his operation, scoring both goals in the South American side's 2-1 win. 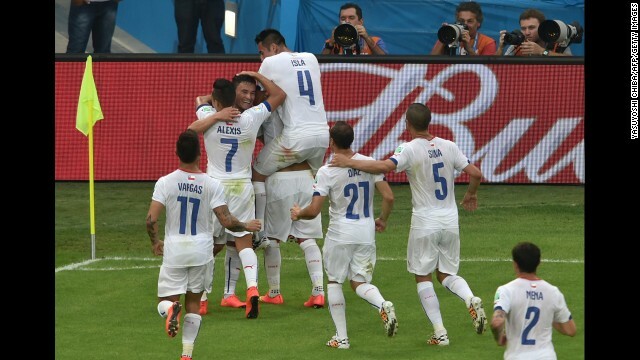 Uruguay's next game will be against Colombia on Saturday in Rio de Janeiro. 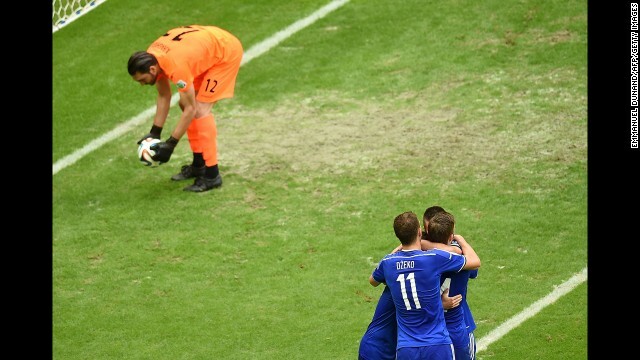 Meanwhile, Italy coach Prandelli says he will step down following another World Cup disappointment. 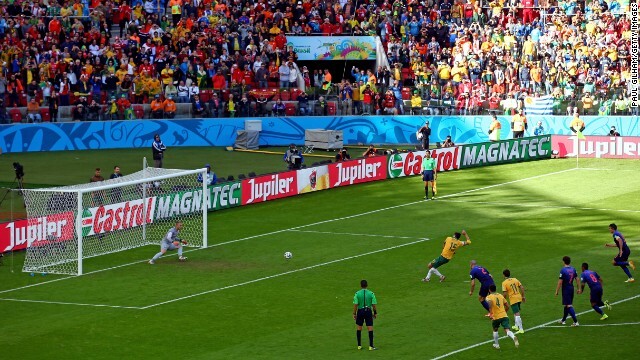 Prandelli, who replaced Marcello Lippi as coach in 2010, also failed to guide Italy out of the group stage in South Africa four years ago. 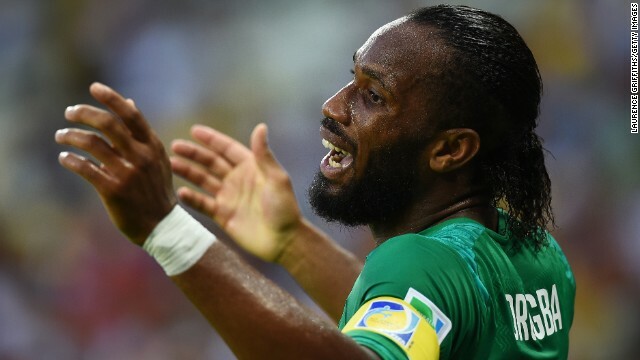 "At the end of the match I spoke to the president of the federation, I have told them I am going to resign from my position," he told reporters. 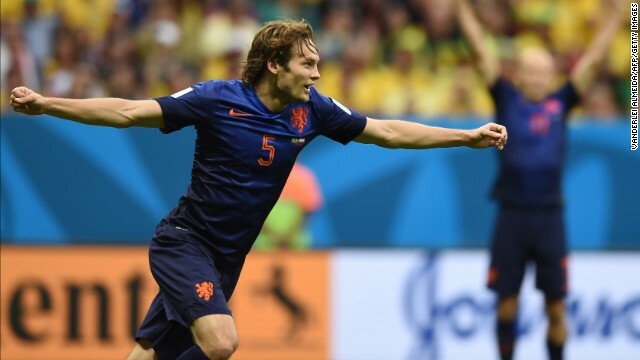 "When there is failure, the person in charge must take responsibility," added Prandelli, who only extended his contract last month. 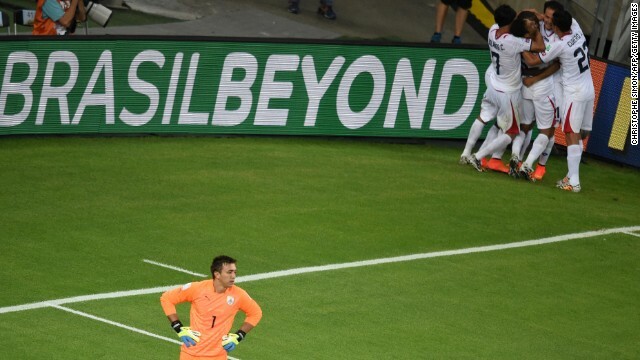 Giancarlo Abete, the president of the Italian Football Federation, also announced his resignation while stating he hoped to convince Prandelli to stay on. 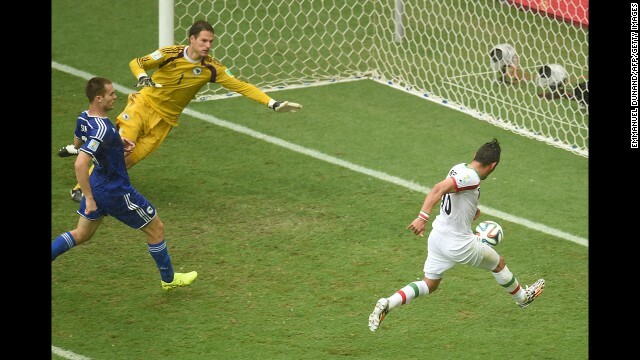 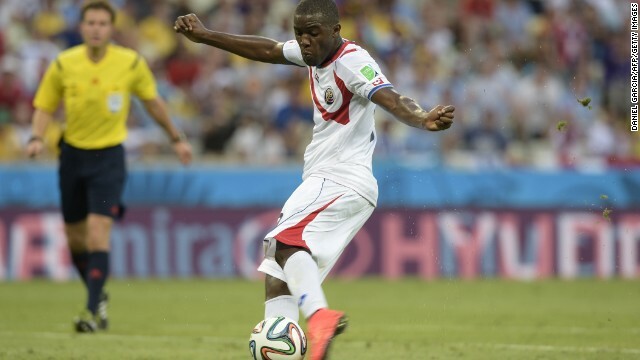 In the group's other game, Costa Rica sealed top spot with a goalless draw against England. 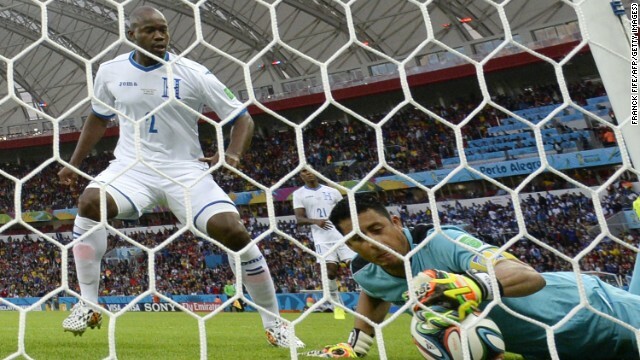 Los Ticos, which won both of its previous games, will play Greece in its next game in Recife on Sunday.